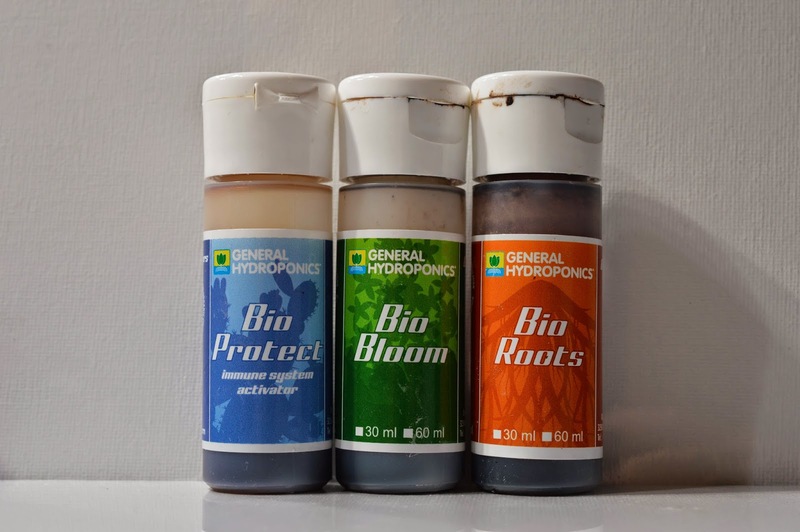 In this post I will expand upon Part 4 of this series and go into more detail about the various soil components I currently use (to a larger or lesser degree) for my cacti and succulents. I will first discuss organic and inorganic soil, and then go through the different soil components I use to a larger and lesser degree. I prefer an inorganic soil to an organic based one for most of my plants when they are past the seedling stage. There are several reasons for this. 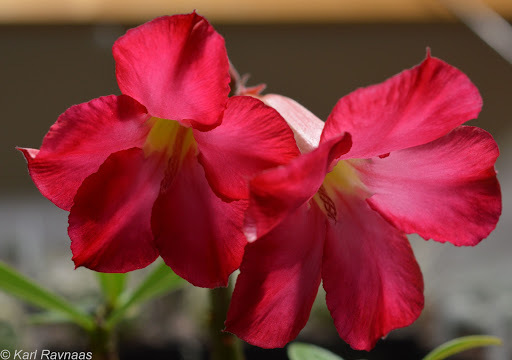 One is that most of the species I’m currently growing (and most of those I like the best) are susceptible to overwatering and thus require a very free draining soil which doesn’t retain moisture for a long time. This is easier to achieve with an inorganic soil than an organic one. Another is that inorganic soils reduce or eliminate the risk of several pests such as the sciara fly and (I believe) the root mealy bug. A further reason is that an inorganic soil with little or no freely available nitrogen will more easily induce a compact form of growth, compared to organic based soils in which plants more easily stretch. Yet another reason is that with an inorganic soil it is possible to grow the plants completely without the use of fertiliser and have them look very natural (approximating the “natural” look in habitat), though I am not currently growing any of my plants without fertiliser. If one chooses to grow the plants without fertiliser, one must take care to choose a soil mix that contains all the nutrients the plants need. 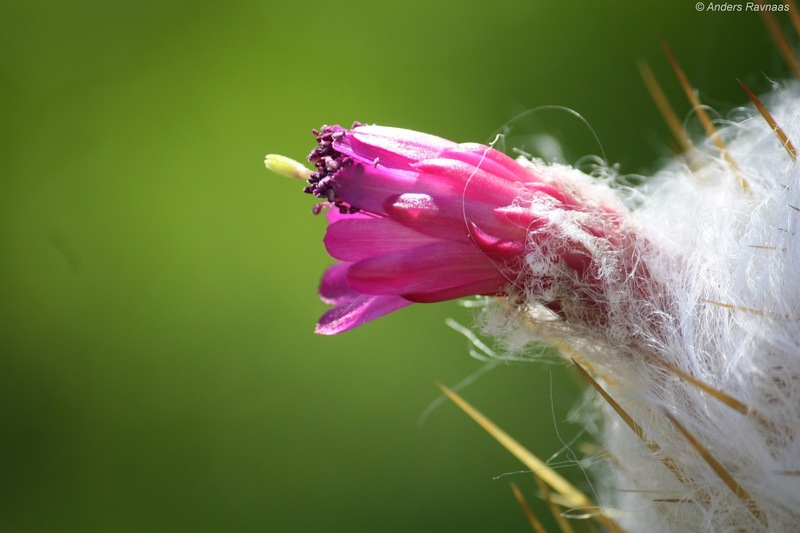 In the journal Acta Succulenta which is a free online journal available for download from their website Acta Succulenta, there is a very interesting article in the second publication of this year discussing a method of growing cacti they call WIG (Wild Grown). A similar method is discussed at length in a Xerophilia Magazine special edition called “The Rock Eaters”, which is also an excellent guide to the use of inorganic soils. It is available for download from their homepage Xerophilia. Personally I find plants grown this way to look more beautiful than plants seen grown in organic soils which tend to become more elongated or bloated – though this also depends on the species. 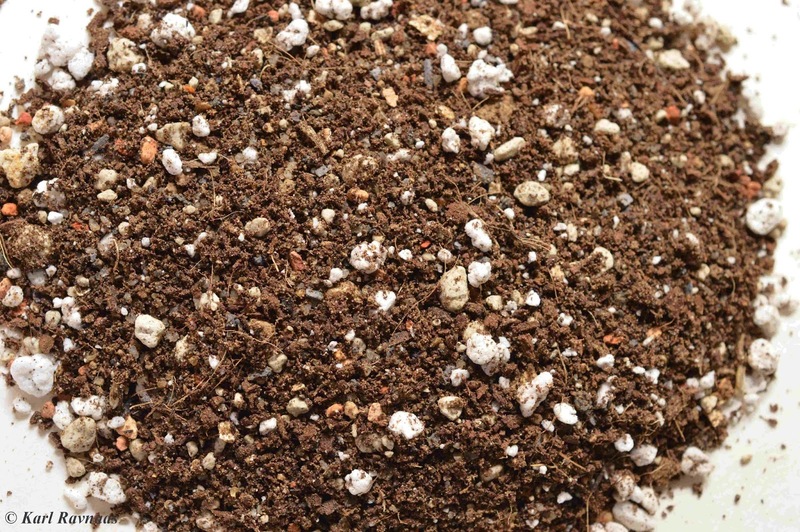 Example of an inorganic soil. A very interesting article which appeared on the BBC a few years ago ago reveals how (many or most?) cacti live in symbiosis with bacteria in the soil that break down rocks around the roots allowing them to absorb nutrients that wouldn’t otherwise be available. 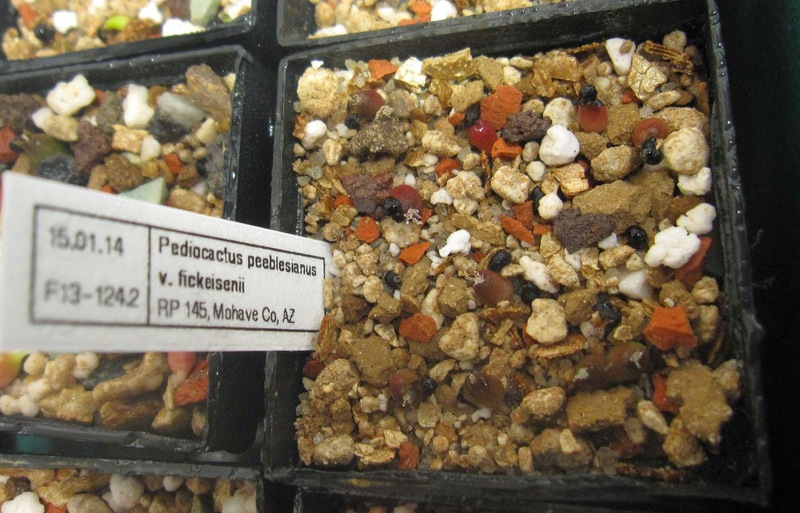 It also shows how the plants incorporate these bacteria into their seeds. 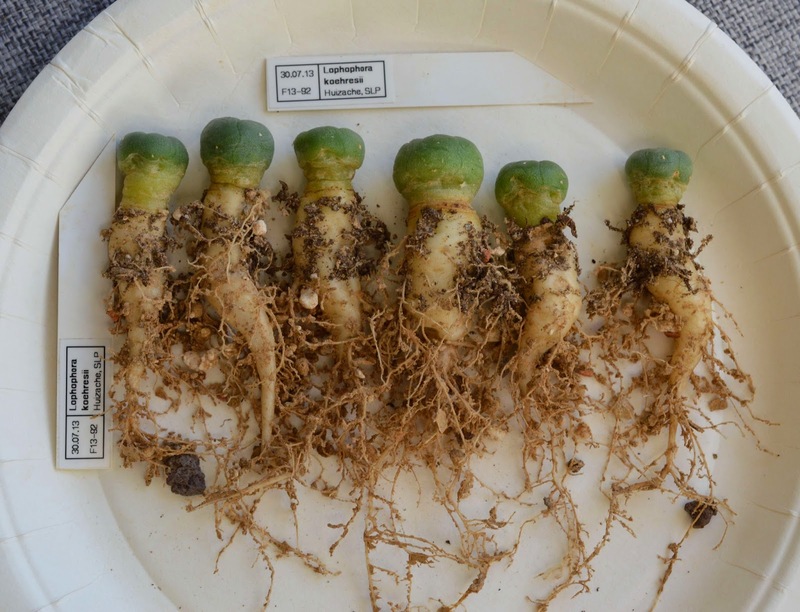 This explains how it is possible to achieve excellent results by growing cacti in 100% inorganic soil without using fertiliser. 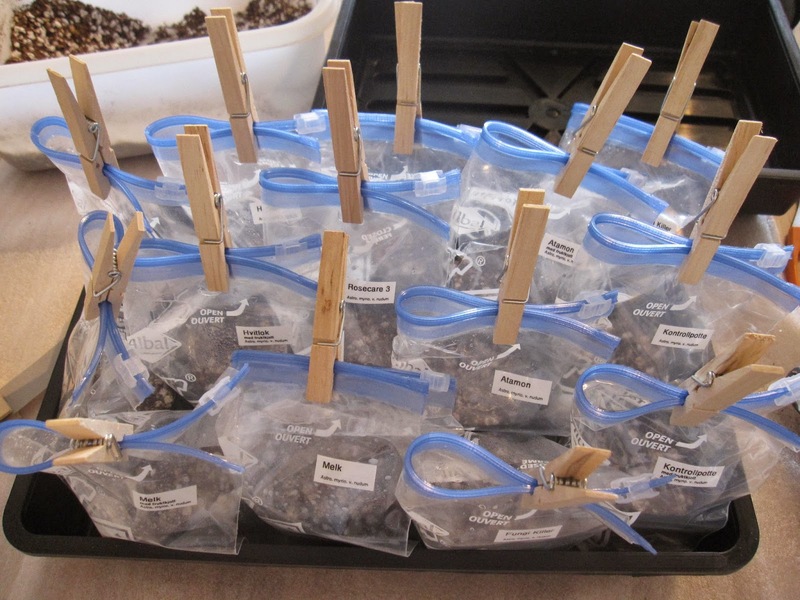 I grow almost all my current North American species in an inorganic soil. Only about one tray with North American species are potted in an organic based soil in order to compare their growth with similar species grown in an inorganic soil. 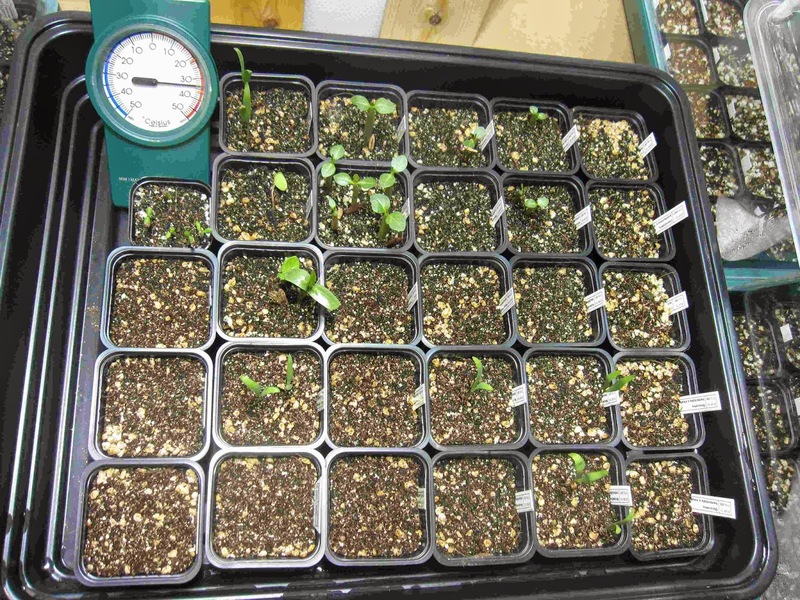 So far the plants grown in the inorganic soil seem to do better and stay more compact. Since they all share the same level of light and amount and frequency of waterings, as well as the amount of fertiliser given and soil volume, and they’re all the same age, I think the only thing of importance that separates them is the soil composition. 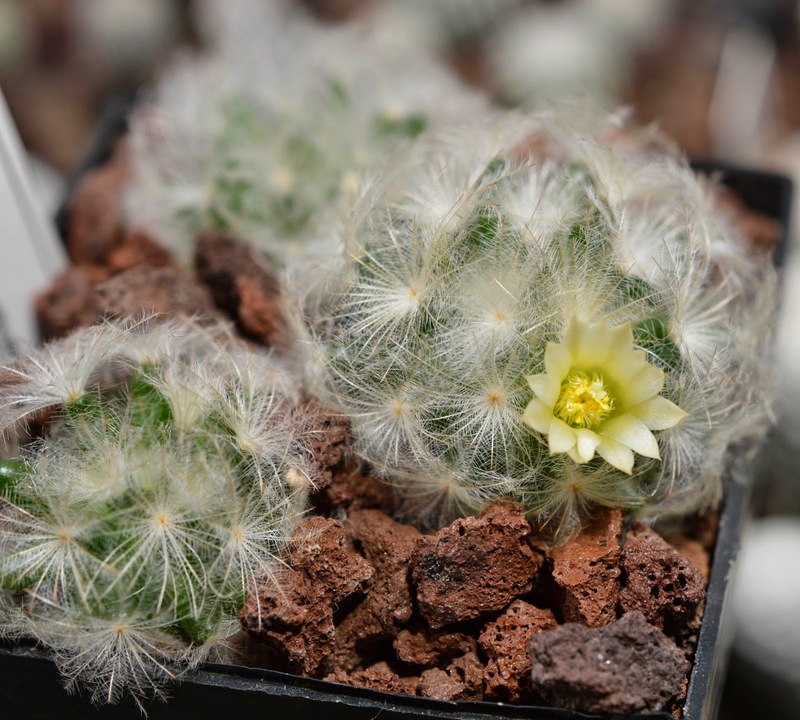 The ones in an organic based soil (particularly Epithelantha and Mammillaria) all tend to elongate and become more bloated compared to those grown in an inorganic soil. I do grow some species in an organic based soil because I feel they do better with some organic matter. 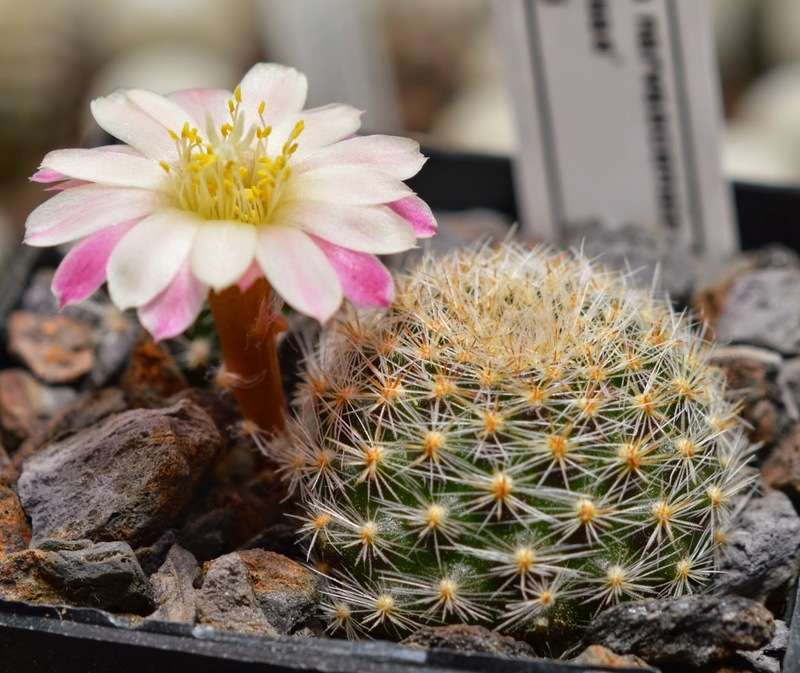 Chiefly among those are the South American species such as Rebutia, Sulcorebutia, Lobivia and Frailea (and any other South American species not growing in particularly arid environments). 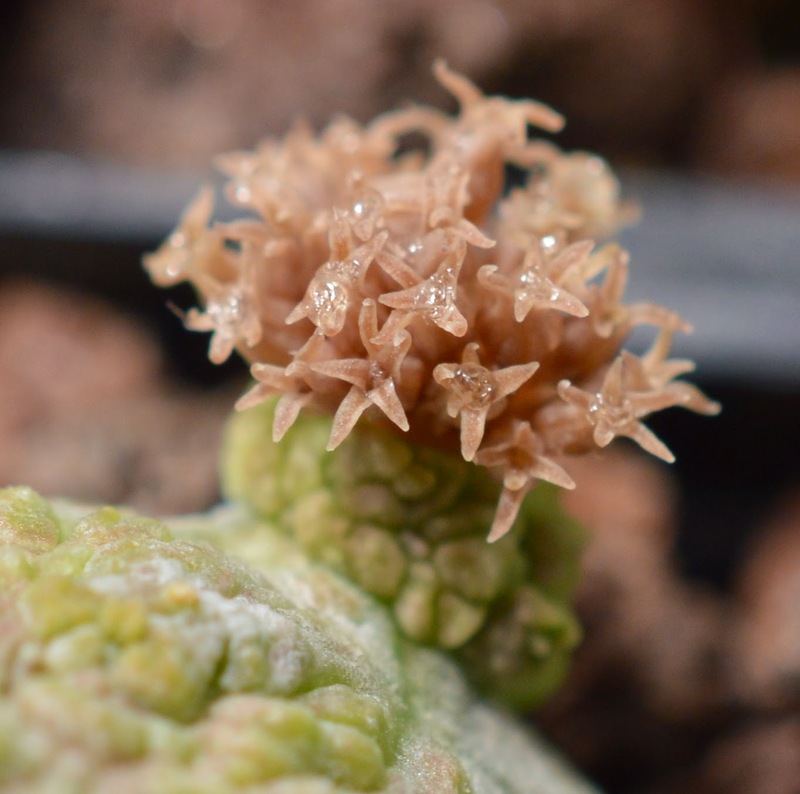 I kept my Frailea asterioides in an inorganic soil for some time, but they grew only very slowly. 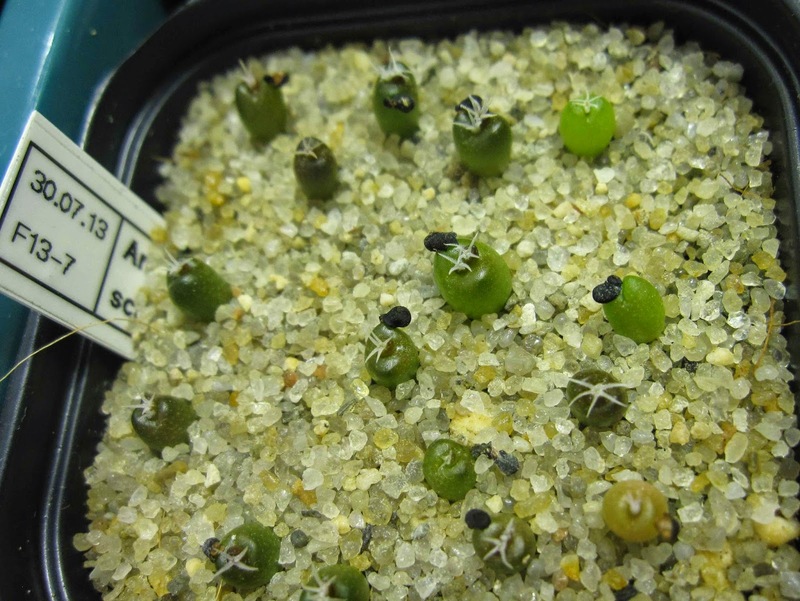 I keep my Discocactus horstii in an inorganic soil, however, and they are all growing very well – though in nature they grow in almost pure quartzite sand and gravel. 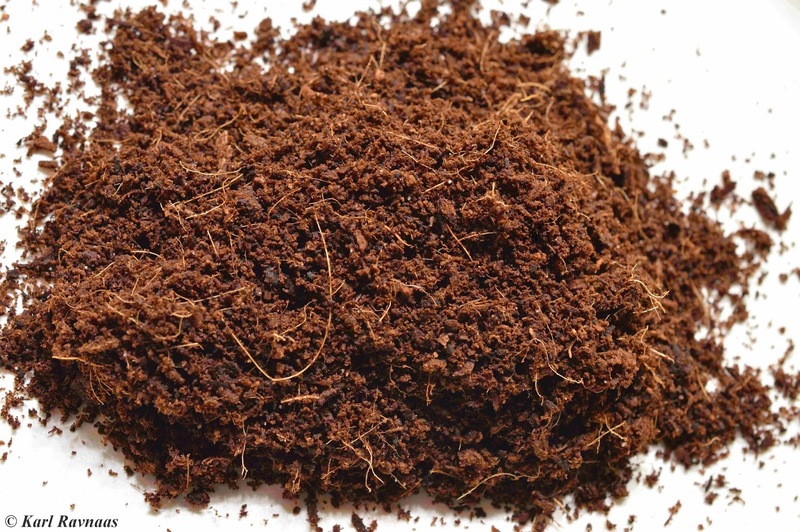 Example of an organic soil. This one is based on coir. What you decide to grow your plants in will depend on your own beliefs and ideas on which soil is the best, which soil components are readily available where you live, the cost of the various soil components, and the types of species you like to grow. There is no answer to which soil is the best and almost every book on cacti will offer different advice. One should also keep in mind that cacti grown in pots are wholly removed from their natural habitat and must be treated accordingly. 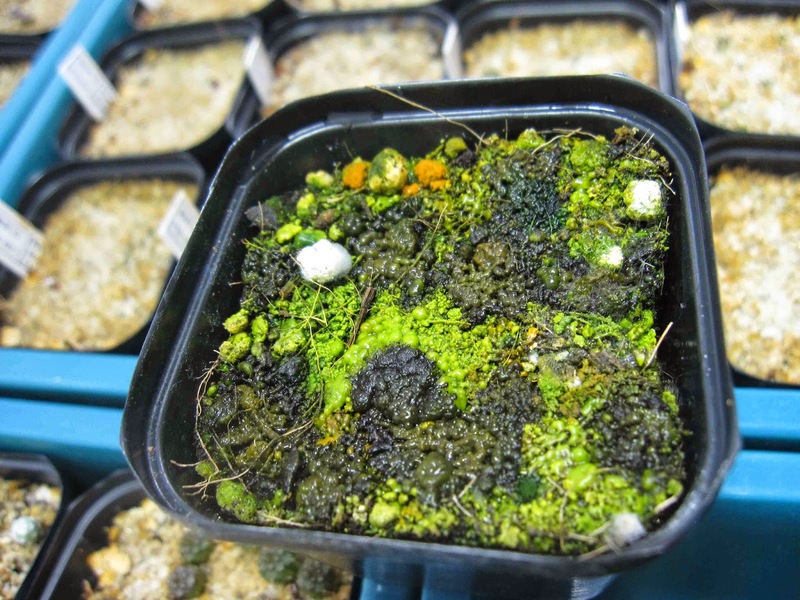 Adaptations must be made to account for a (probably) much reduced living space for the roots, a different fungal and bacterial flora in the soil, and of course usually a vastly different climate. 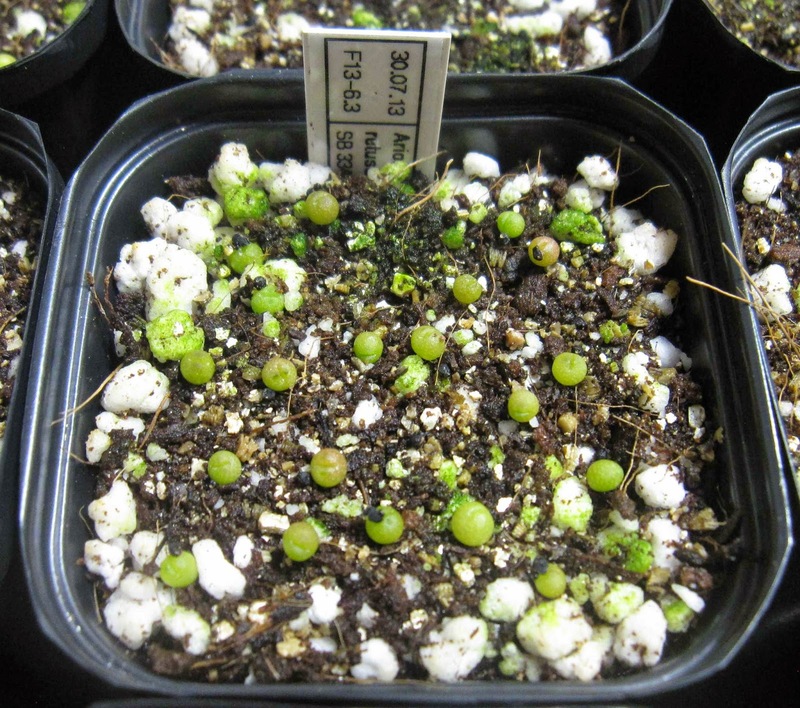 Just like seeds will readily germinate in commercial cactus soil mix, so will most species grow happily in the same mixes. They will be more prone to rotting though. If using such a mix I would definitely recommend adding extra grit such as perlite or gravel to increase the drainage. There are a plethora of different soil components available, and the following simply represent the various things I have personally used and have experience with. As I said above, there is no “correct” soil and one grower will have positive experiences with one soil while another will not. The only soil component that I would actively advice against is peat. I discussed my reasons for this in Part 4, but to summarise very shortly: peat takes a long time to dry out and when it has first dried out it is very difficult to re-wet; it is a magnet for the sciara fly, and the root mealy bug too, I believe; it quickly becomes compacted and reduces the amount of air available to the roots; it clings to the roots so that during repotting it is difficult to remove all of it without damaging the roots; it often leads to a less developed root system; it contains a high amount of nitrogen (and is often augmented with fertiliser high in nitrogen) which can lead to root burn and also abnormal growth; and finally it is not very environmentally friendly as the extraction of it destroys natural habitats for many species and can take centuries or millennia to reform, as well as leading to increased greenhouse gas emissions through the release of CO2 and MH4. 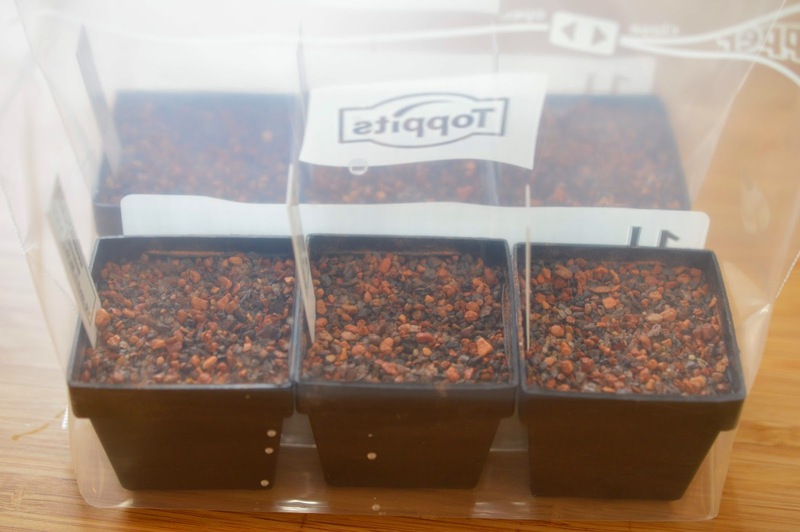 The only reason to use peat in my opinion is if you are just starting out with the hobby and only wish to keep a few species in the window sill, or if alternatives are very hard to come by. I’m only mentioning this very quickly as it is probably the most commonly used ingredient in organic based soils. I do not use it myself because I have not found a good manufacturer yet. In Norway there is as good as a monopoly when it comes to garden centres, and by far the biggest (and almost only) garden centre does, to the best of my knowledge, not sell composts – at least not any that are useful for growing cacti. Some local garden centres or plant schools may still sell quality composts though, again, I have not really come across any. A good quality compost is probably the best ingredient to use in an organic based soil because it provides most of the nutrients the plants need which reduces the need for fertiliser. 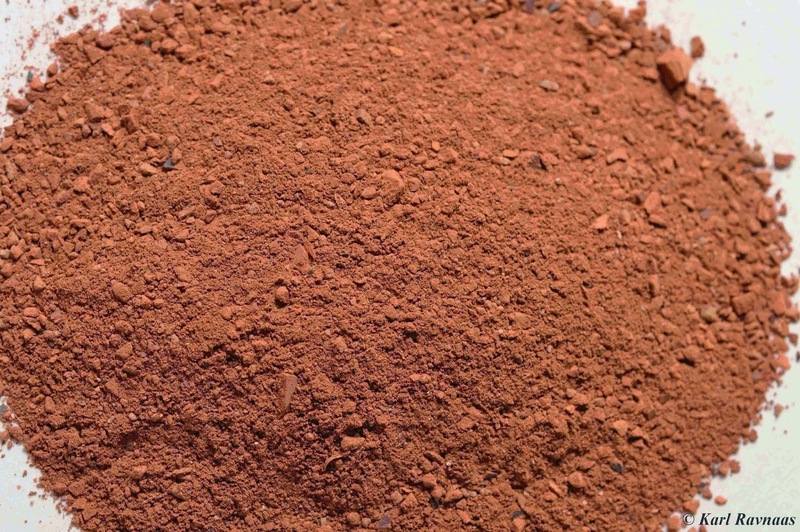 Coir is fibres extracted from the husks of coconuts. It is a far better alternative than peat for organic soil mixes. Among the advantages are that it is naturally free of bacteria and fungi, it is easily rewettable after drying out, it doesn’t compact like peat, it doesn’t cling to the roots, and it rarely clumps together (and if so the clumps are very easily crumbled apart). Among the disadvantages is its lack of nutrients which means a greater need for fertiliser, its light weight (which in some cases can be an advantage, though), and the fact that it is poor in calcium and magnesium. A lack of magnesium is a problem for all plants, but a lack of calcium is also especially negative for most cacti. This can be remedied by adding calcium and magnesium through fertiliser or by adding rocks such as dolomite (containing both magnesium and calcium) directly to the soil. 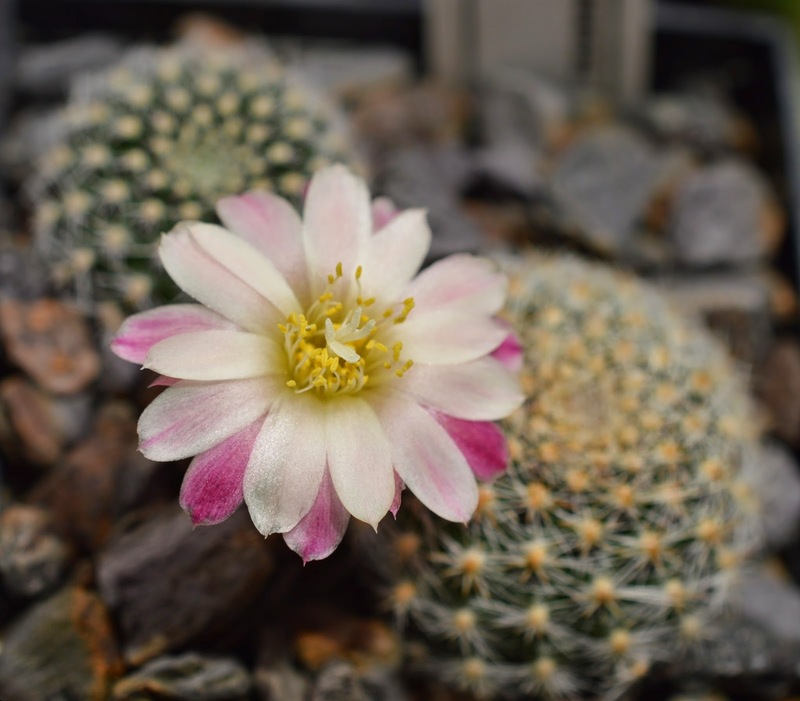 Dolomite is an excellent rock to add to the soil for most cacti regardless of whether you use coir or not. Finally it is also important to check whether the coir you have has had fertiliser added to it. As with peat mixes, I believe fertiliser is often added to bags of coir too. Coir. A very good substitute for peat. 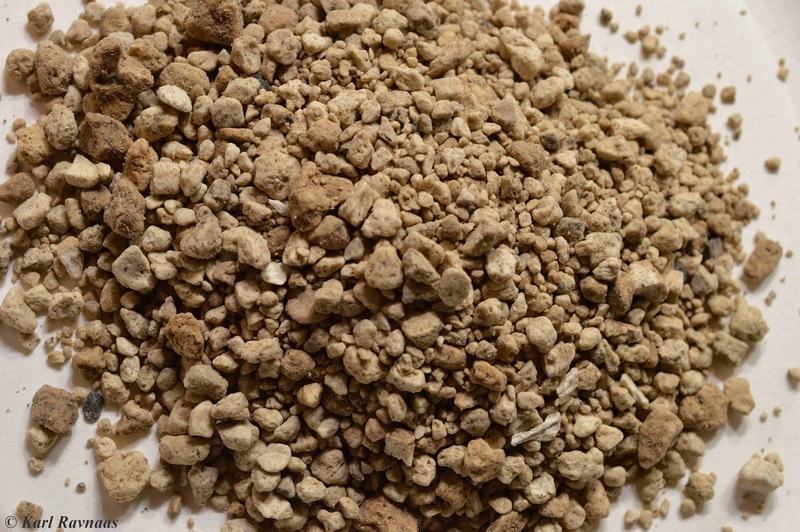 Leca (light expanded clay aggregate) is produced artificially by heating clay at very high temperatures. It improves drainage and with it’s honeycomb structure it also retains a lot of air. 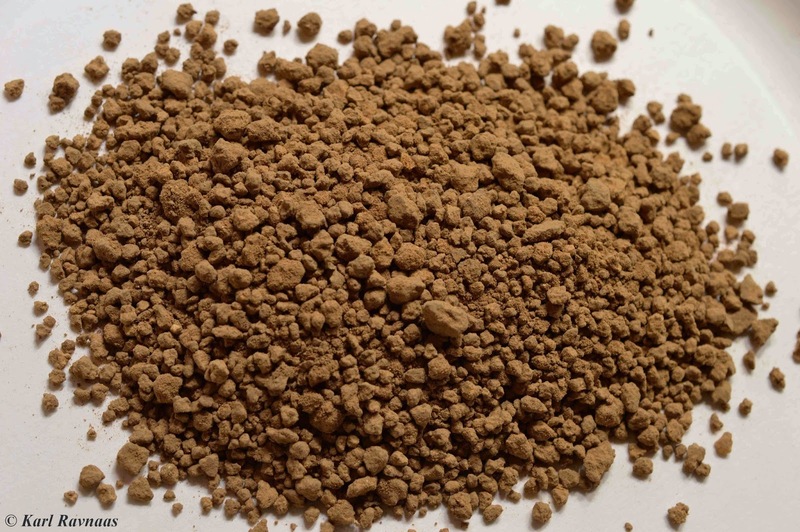 Leca usually comes in sizes too large to be of much use in small to medium size pots. In large or very large pots it would be useful as a soil additive. For smaller pot sizes the main use would be to increase drainage by placing a shallow layer of leca pebbles in the bottom of the pot. It can also be useful as top dressing in larger pots, though it should ideally be washed before use to remove the dust coating the pebbles. Leca pebbles are usually too large to be of much use in small and medium size pots. 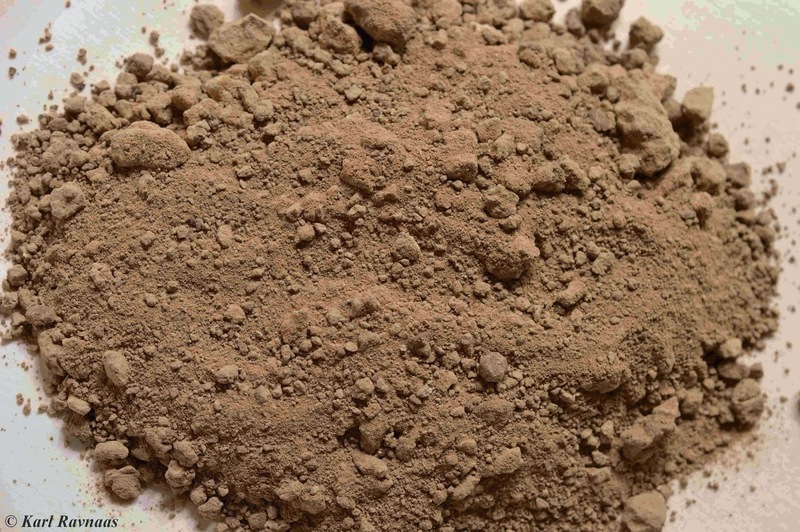 As with leca, this product has also been fired at high temperatures in order to make it expand. 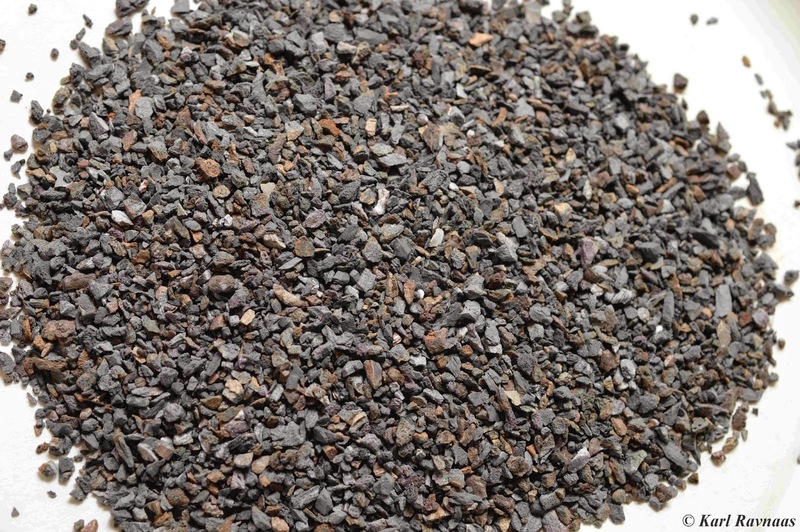 Shale is a naturally finely laminated (fissile) sedimentary rock consisting of clay and silt size particles. When it expands this structure leads to the rock becoming very porous. It has similar soil improving characteristics as leca, only more suitable for small to medium size pots. I have used two sizes, a 4-8 mm grain size and a 1-3 mm grain size. For smaller pots the larger grain size is still a little on the big side, but the smaller grain size is ideal. Similarly to leca it doesn’t lose shape or disintegrate. The larger size expanded shale is also useful as a top dressing. 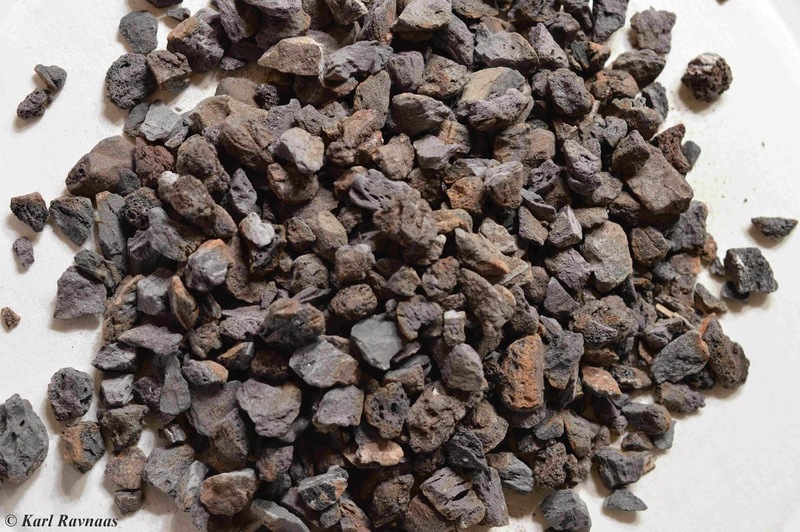 Expanded shale, grain size 4-8 mm. Expanded shale, grain size 1-3 mm. This soil additive is, as the heading says, crushed lava. It is naturally a very porous rock increasing drainage and improving soil texture. It is heavier than artificially expanded materials and so adds a bit of weight to pots (which might otherwise become a bit light if a lot of material like coir or perlite is used). The grain size I have used is 2-8 mm, which is on the large side for small pots. It is also useful as a top dressing, though its sharp edges may cut or scrape the plant as it grows and expands. Crushed lava, grain size 2-8 mm. 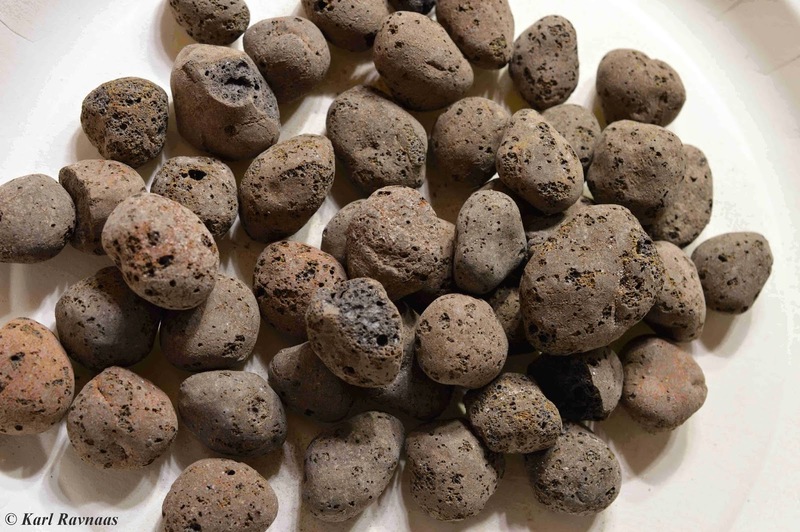 Pumice is a highly porous volcanic rock and a very good soil additive. Much like the materials mentioned above, it improves soil drainage and structure, as well as retaining water and air which is slowly made available for the roots. 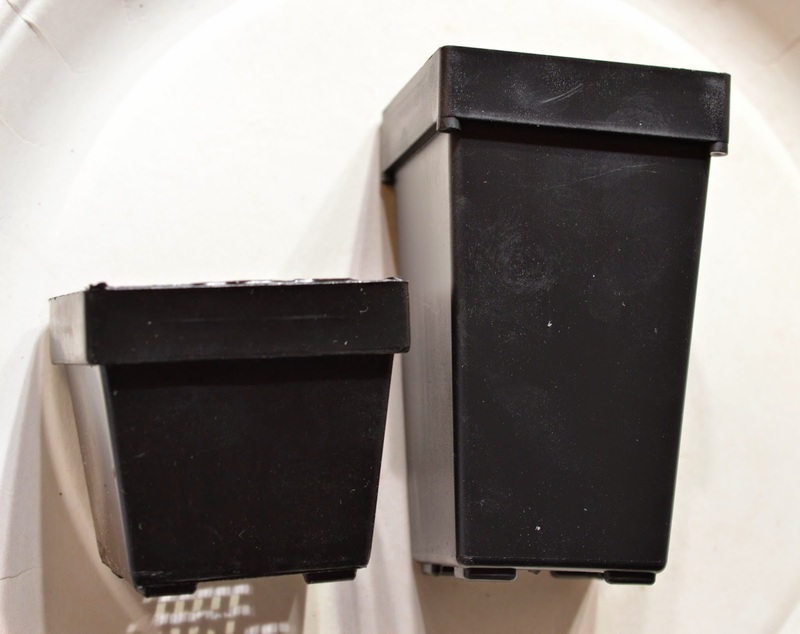 It comes in many different sizes, though – like the above materials – the larger sizes are less suitable for small and medium pots. 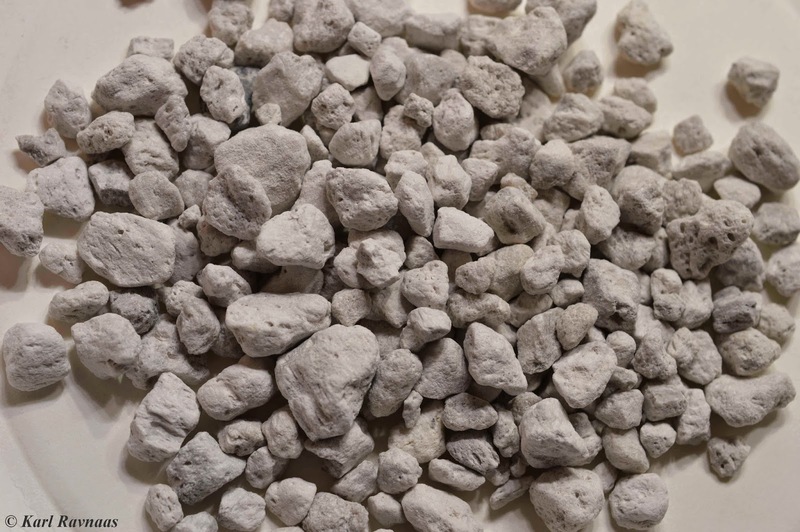 Pumice, grain size 5-15 mm. Pumice, grain size 2-5 mm. 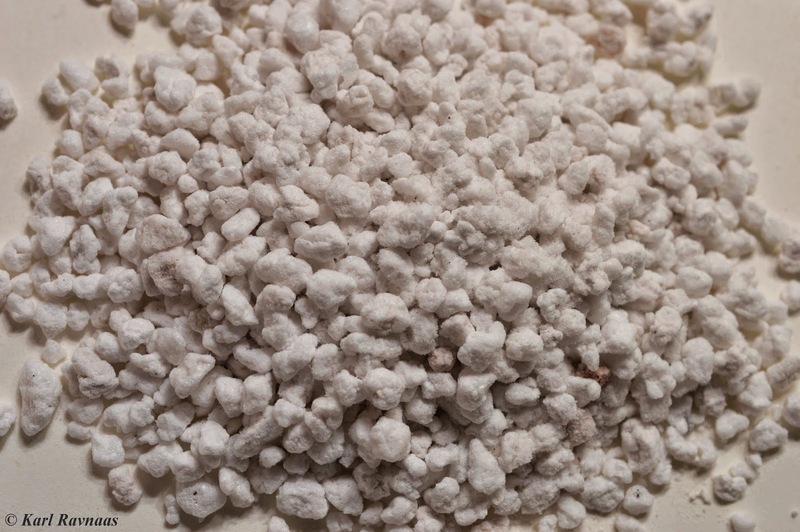 Zeolite is a very porous aluminosilicate mineral. It occurs naturally but can also be produced artificially. I use a natural form which comes in gravel size. It is widely used as an adsorbant in various industries. It absorbs a lot of water and, due to its molecular structure, can retain various elements. The idea behind using it in the soil is that its capacity to adsorb and retain elements will lead to these becoming available to the roots as the water stored in the mineral is released as the soil dries. However, I am uncertain if it actually works as intended in the soil. To me it seems like the zeolite doesn’t really leach these “trapped” nutritional elements as the water drains from it, but rather builds them up to the extant that salts crystallize on the surface. If this is, in fact, the case then its usefulness is very limited since its other chief value of retaining water is achieved by lots of other materials. One other use would be top dressing for certain plants, as its green colour is very nice. Zeolite, grain size ca. 5-10 mm. This is another useful material to add to soil. 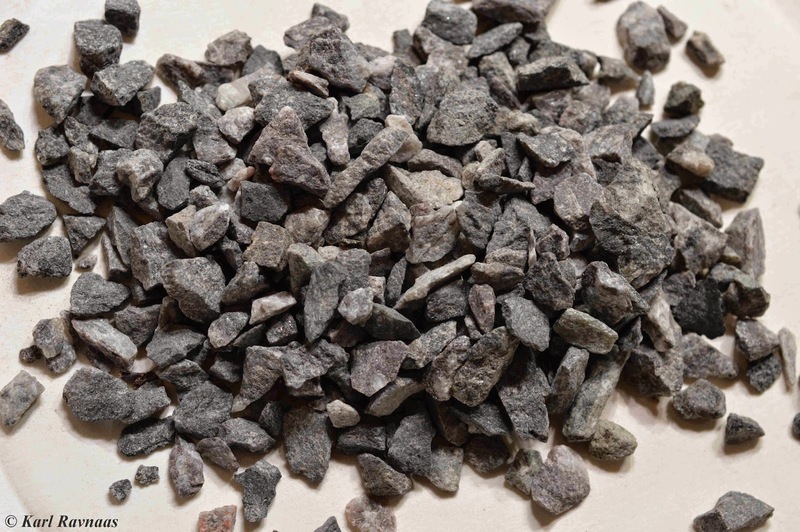 Gravel size it acts to improve drainage and soil structure, as well as absorbing water which is then slowly released into the soil as it dries. In finer sizes it is useful as top dressing and soil component for seedlings. Made from clay, there are also a lot of various minerals available for the roots to extract. 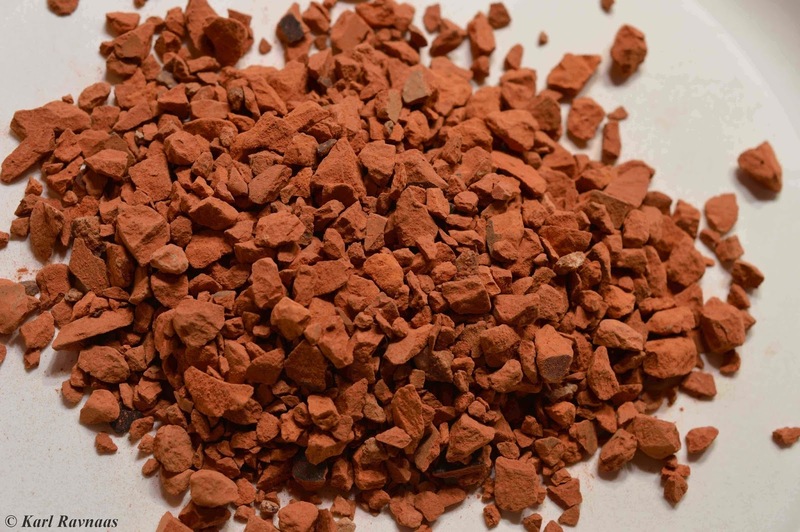 Crushed terracotta, grain size ca. 4-6 mm. 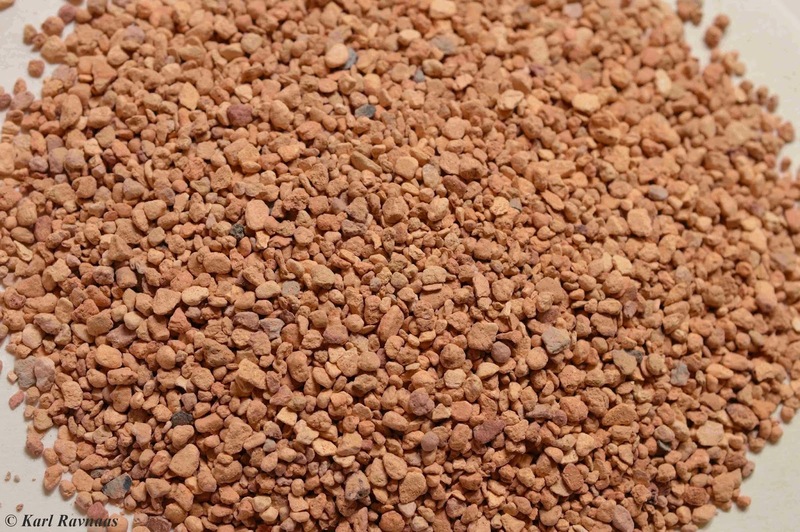 Crushed terracotta, grain size 0-2 mm. Clay can be a very useful additive in small components. Because of its very fine grain size it can reduce drainage in the soil and retain too much water if there is too much clay in the soil. It contains a large amount of elements however, and in small amounts it is a useful additive. As can be seen on the picture, there are many large clumps of clay. These can be problematic in the soil as they can create areas where more water than desirable is accumulated. Akadama is the name of clay pebbles that occur naturally in Japan. They are widely used in the bonzai industry because of their ability to absorb a lot of water and retain their structure as they dry, and repeat the process over and over. 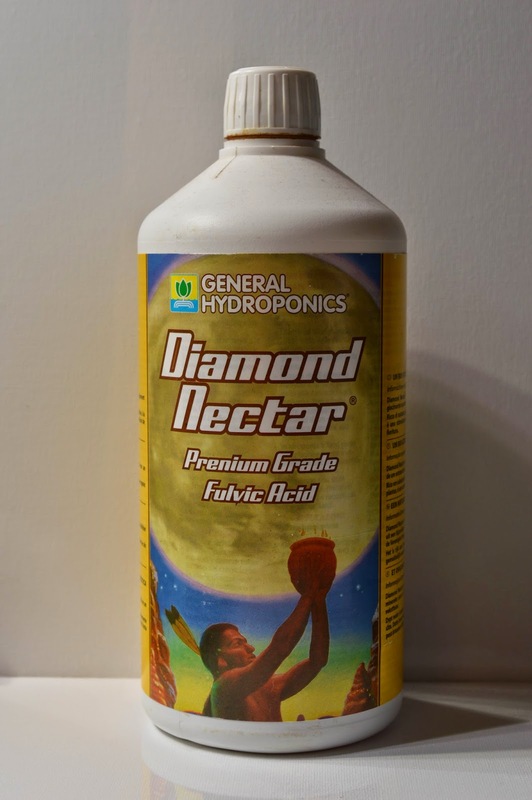 It improves drainage and aeration in the soil, as well as providing a lot of nutrients. It is an expensive product, however. 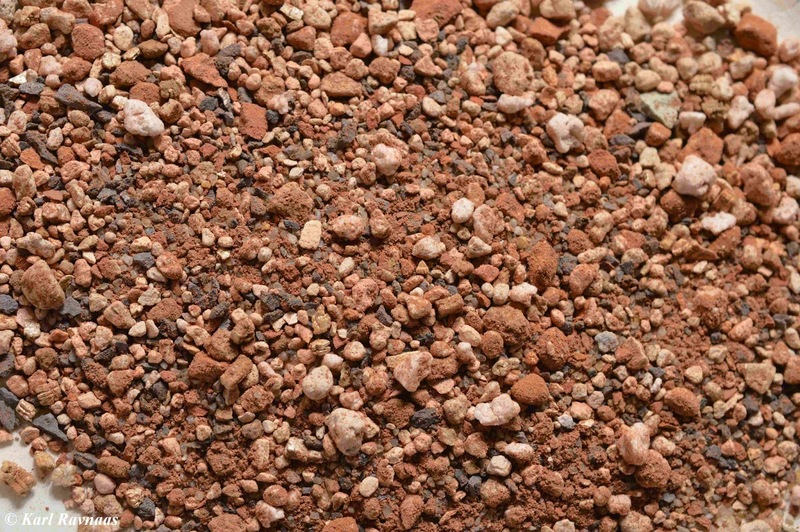 Akadama clay pebbles, grain size ca. 2-4 mm. Sand is a much used soil additive. Added to organic mixes it helps improve drainage and soil structure. However, in inorganic soils I believe it has a tendency to move around and cling together with other sand particles creating zones with more sand, which leads to reduced drainage. In many cases it may be better to use either coarse sand or fine gravel which will do the same job as sand, but not potentially impact negatively on drainage. Sieved filter sand, grain size 1-2 mm. 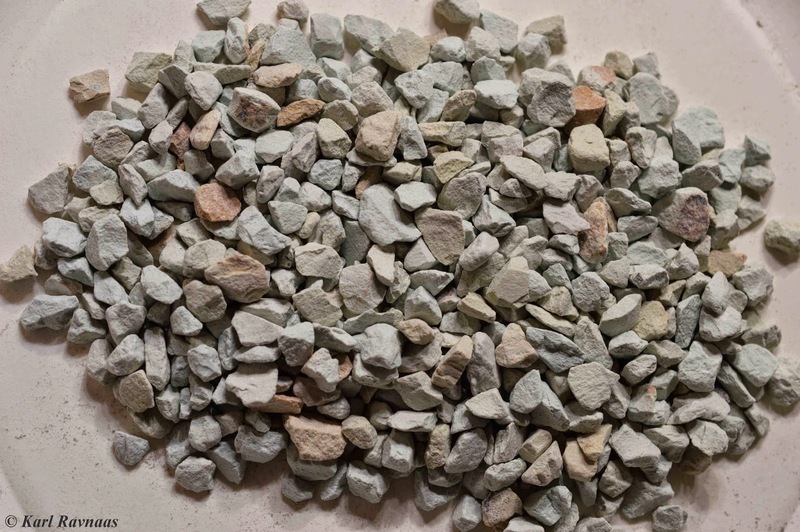 Gravel, particularly as crushed rock, is a useful soil additive to improve drainage and structure. It is probably the cheapest inorganic material too (along with sand). 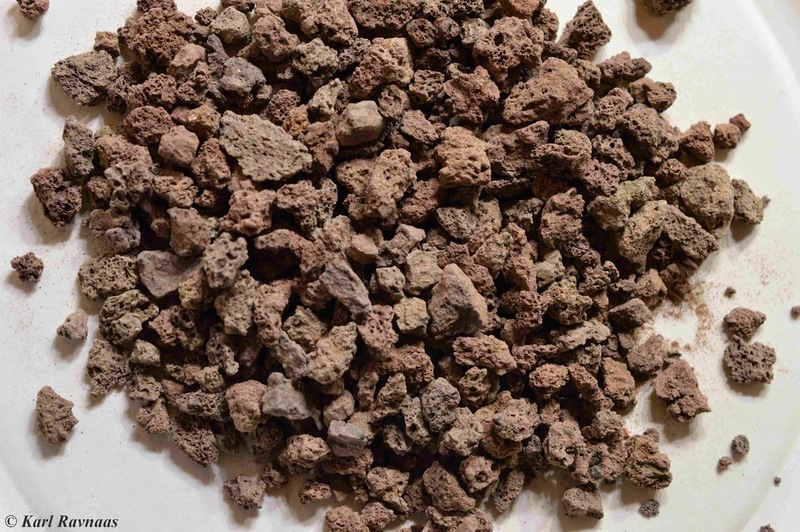 If you want to grow in a completely inorganic soil it is perfectly possible to do so by combining gravel from different rocks and minerals in the soil to provide all the nutrients the plants need. 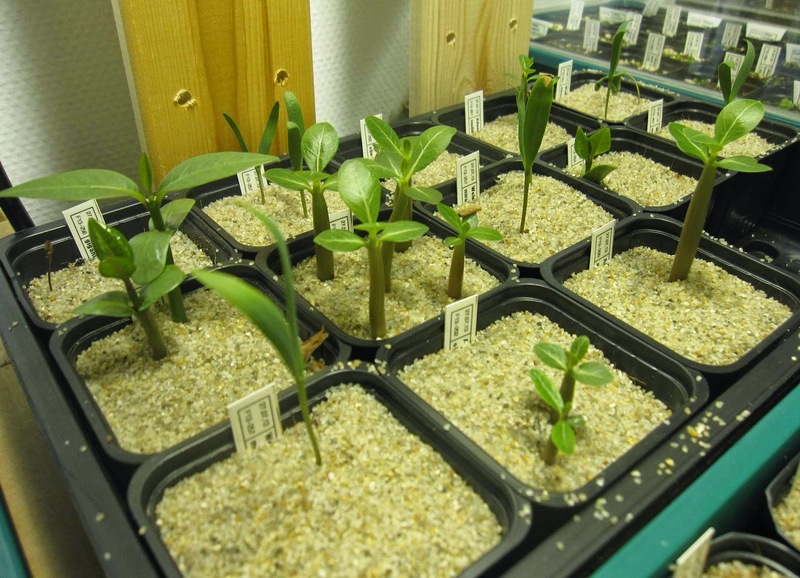 For seedlings and in small pots it may be of less value as smaller size material will probably be better, but in medium to large pots it is an excellent additive. It is also excellent as top dressing. Crushed phyllite, grain size ca. 5-10 mm. This is a light, porous sedimentary rock consisting of fossilised remains of diatoms. It consists mainly of silica and some aluminium. 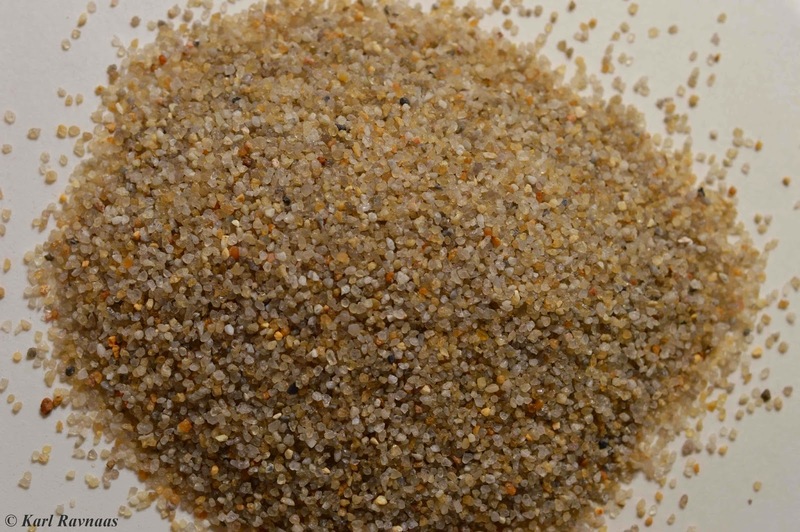 It comes in a range of grain sizes from dust all the way up to gravel size, and has a wide variety of uses. It retains water and nutrients which is slowly released as the soil dries. I don’t have a lot of experience with this material but it seems a good soil additive. Diatomaceous earth, grain size 1-3 mm. This is an extremely light volcanic material that occurs naturally, but is used only after being processed by firing it at very high temperatures, expanding the material greatly. It helps improve drainage and soil structure, while having a fairly low water retention capacity. It is a very useful material and fairly cheap, however its low weight can be an issue as the perlite particles will very easily float to the surface of the pot – especially if watered from above. Perlite, grain size ca. 3-6 mm. 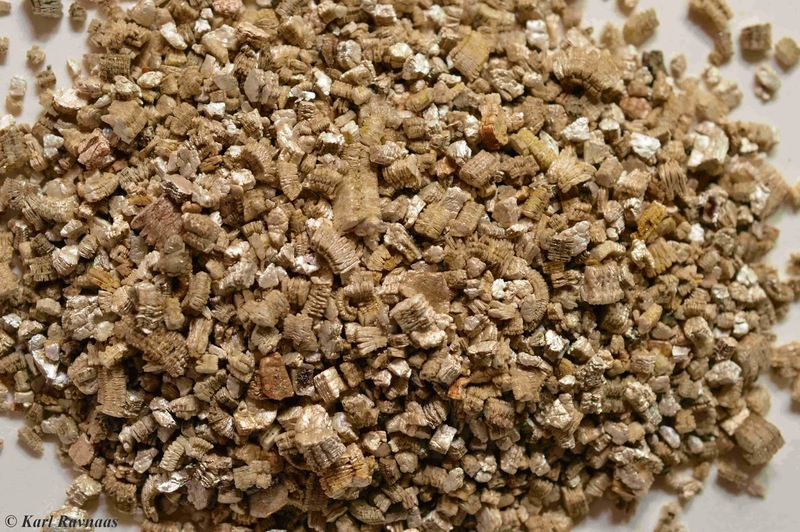 Vermiculite is a naturally occurring siliceous mineral that expands greatly when fired – like perlite. After being processed in this way it becomes a very useful soil additive to improve drainage, for retaining water and nutrients, and for increasing soil structure. While also extremely light, it doesn’t float to the surface like perlite. Vermiculite, grain size ca. 3-8 mm. This material is something I don’t quite know the usefulness of as a soil additive. It is a dust-like yellowish material that is supposed to contain 65 different minerals and 60 % of the content is supposed to be water soluble silicates. 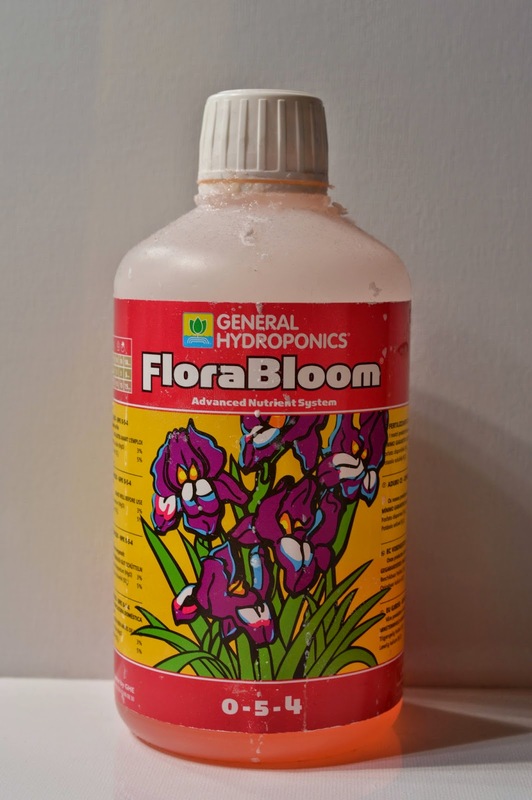 Spread around the top of the soil it is supposed to prevent algae and fungi growth, while as a foliar spray it is supposed to act as an insecticide. As a soil additive I don’t know whether it is a very useful substance considering all the minerals it supposedly contains, or whether the dust size grains merely leads to reduced drainage. It is supposed to increase the cation exchange rate in the soil which should lead to more nutrients being available for the roots. I add a little bit of it in my soil mixes. If it does what it claims it should be a useful additive. Mineral magic. With a saguaro (Carnegiea gigantea) pictured on the label it surely can’t hurt to add to the soil! In the end, it isn’t really critical to use one particular soil component or the other. I have tried out quite a few because I’ve been curious about how they work, but many of the materials talked about above do much the same thing. The important part about soil is that it should be well drained and have a good structure with plenty of air. Whether this is accomplished through an inorganic soil or an organic based one isn’t that important. The amount of the various materials is only really important when it comes to growing plants without the use of fertiliser at all, since then one must strike the right balance in the soil between the various components so that all essential and beneficial nutrients are provided. The size of the collection and which materials are most easily (and cheaply) available will usually be the deciding factors on which soil components to use. For once there’ll be a post with less text and more images! I feel flowering is one of the best ways to see whether your plants are doing well. If they are of flowering age and their growing conditions are good all cacti will generally be happy to produce flowers. 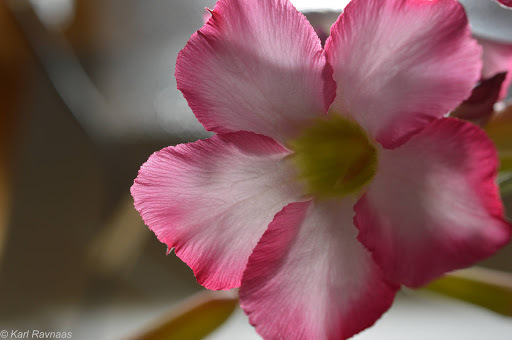 If not, they will be much more reluctant to flower – although flowering can also be induced by high levels of stress or such things as manipulating the plant’s hormones. As I mentioned in the post about fertilisers and additives, I do add a few drops of certain plant extracts with most waterings that are supposed to increase flowering, so it’s possible this may have had an effect on some of the species. 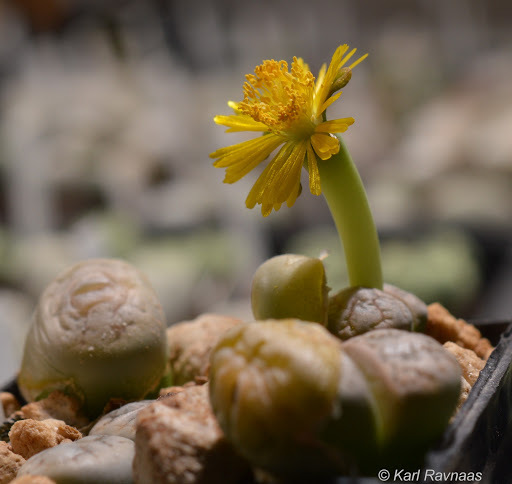 Seeing the little plants develop from seedlings to flowering plants is very rewarding and one of the best parts of the hobby. I plan on giving them about a month’s rest in December to try and induce more flowering. The oldest plants will then be about 16 months old and I think a lot more will be ready to flower at that point. The first of the plants I sowed in late July/early August 2013 to start flowering did so in February, approximately six months after germination. 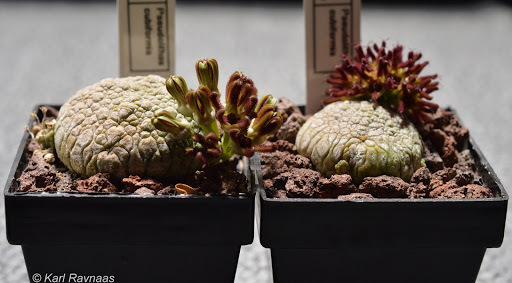 The one to start it all off was Pseudolithos mccoyi. I have no experience with this genus so I don’t know whether it usually starts flowering at a very young age. Since they began flowering in February they’ve kept it up ever since, and now 9 months later they’re still at it. I have no idea how to pollinate them. As far as I know it’s done by flies in nature (though the flowers don’t smell anything), but it doesn’t seem like any flies have visited them over the past months. I don’t know who this species was named for, but I like to think it was Star Trek’s Dr. Leonard McCoy! Pseudolithos mccoyi starting to flower at six months old. The top dressing is crushed lava and the plants are blending in very well! 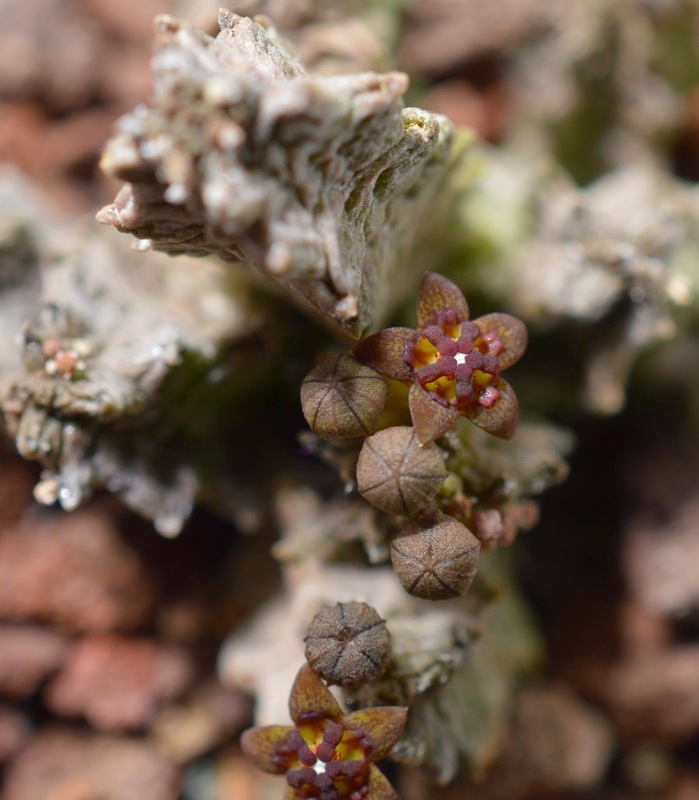 A closer look at the flowers of Pseudolithos mccoyi. This plant is 14 months old here, and it and its brethren have been flowering non-stop for 9 months so far. The flowers are tiny at no more than 5 mm wide. Some of the P. mccoyi (such as this one) have developed a very nice greyish bloom on the epidermis. 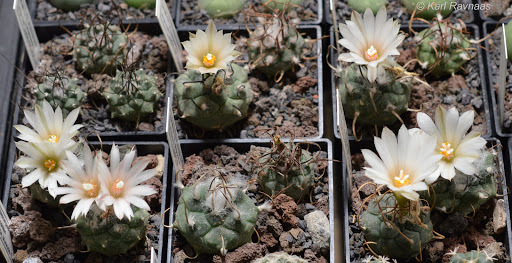 The second species to start flowering was Turbinicarpus longispinus at 7 months old. The name is a nom. prov. (nomen provisorium) meaning a provisional name, and as far as I know has never been validly published. It is supposed to be a synonym of T. rioverdensis ssp. paolii, which is again a synonym of T. rioverdensis according to Hunt et al. (2006), Pilbeam & Weightman (2006) and Zachar (2004). 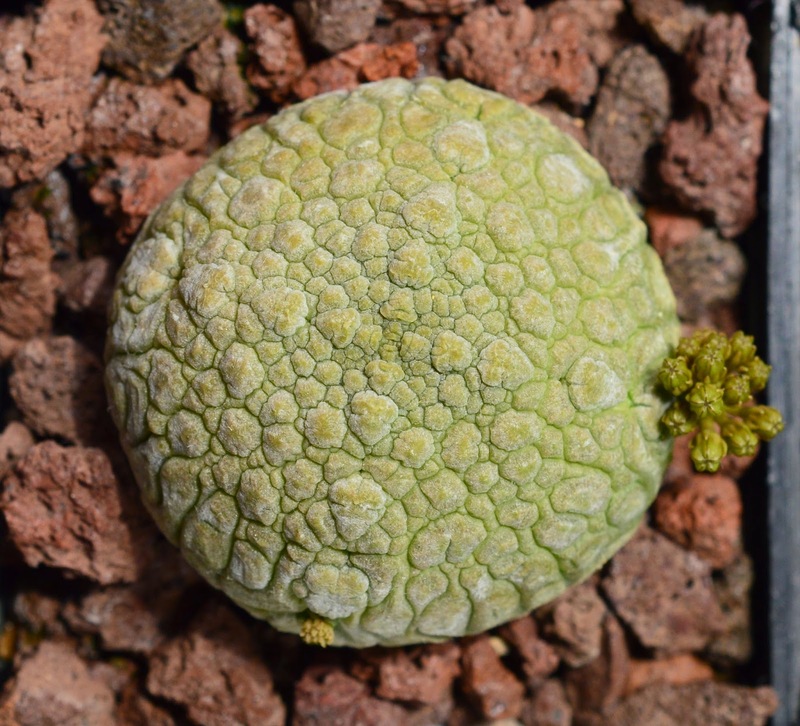 Furthermore, the same authorities place this taxon as a subspecies under Turbinicarpus schmiedickeanus as T. schmiedickeanus ssp. rioverdensis. This should then be the current name of the species. However, if T. longispinus is indeed a synonym of T. rioverdensis ssp. paolii, then according to Donati & Zanovello (2005) it should be called T. klinkerianus ssp. 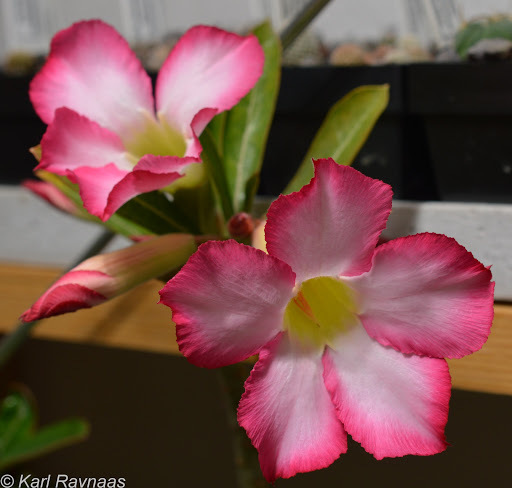 schwarzii as they claim it is just a re-description of T. schwarzii which they place under T. klinkerianus. If they are correct, the name of the species according to Hunt et al. (2006), Pilbeam & Weightman (2006) and Zachar (2004) should then be T. schmiedickeanus ssp. macrochele since they place T. schwarzii under synonomy with this taxon. So…what to think? I now have the following options depending on which authority I’d like to follow: T. longispinus nom. prov., T. rioverdensis ssp. paolii, T. rioverdensis, T. schmiedickeanus var. rioverdensis, T. schmiedickeanus var. macrochele and T. klinkerianus ssp. schwarzii. A Gordian knot if ever I saw one! I am not particularly inclined to agree with Donati & Zanovello (2005) as I think their recombinations of species and way of classifying species is a bit odd. But what exactly to call it I’m not sure. It seems to me to be similar to all of the above mentioned species. I will have to delve into the matter a bit deeper before deciding on anything, so for now they’ll stay as T. longispinus. It’s a nice plant though! Turbinicarpus longispinus in bud at 7 months old. The spination is variable, and not all the plants have longer than usual spines. This plant is about 1,5 cm in diameter. Detail of the flower of Turbinicarpus longispinus. 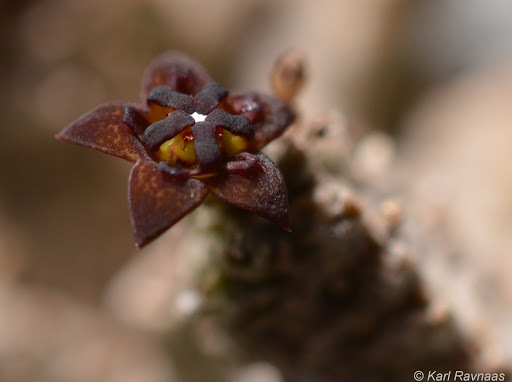 The flower is approximately 2,5 cm tip to tip. Turbinicarpus longispinus at 11 months old. It was cross pollinated and, as can be seen, the fruit has just split open revealing the seeds inside. This plant, ca. 2 cm in diameter, does not have particularly long spines. 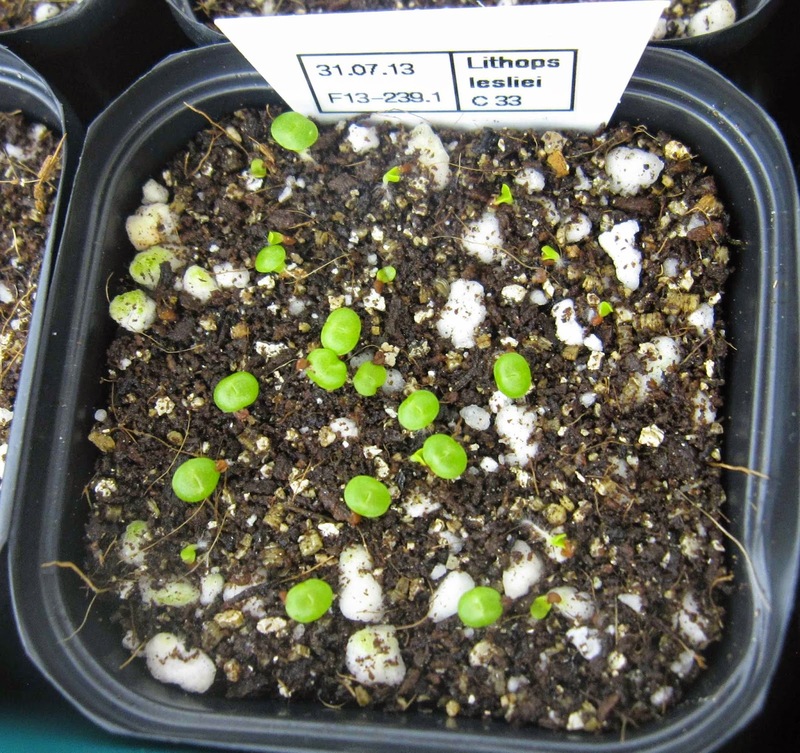 The next one out was Mammillaria roemeri at 9 months old. 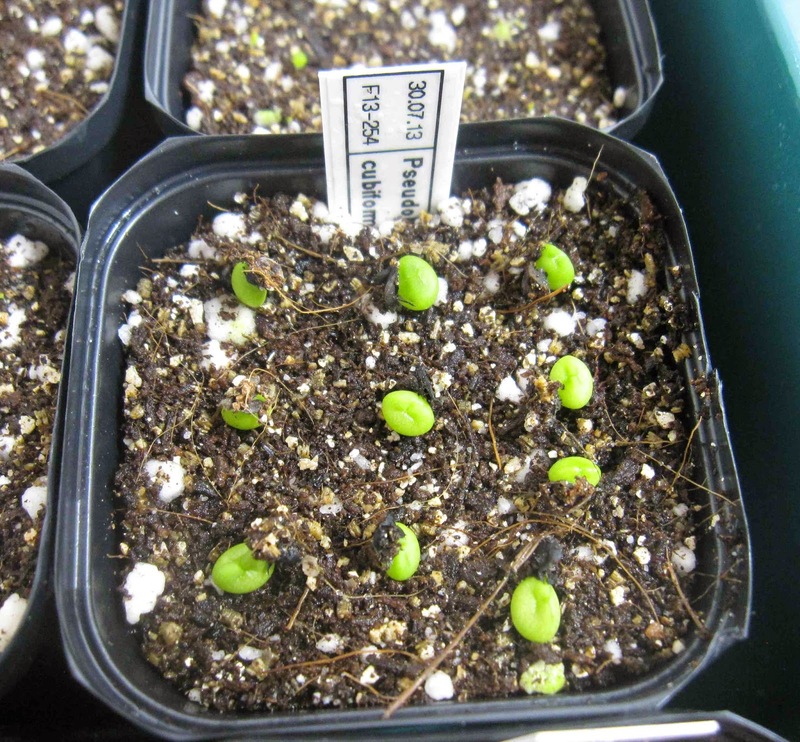 Originally only one plant germinated, but some months later another seedling appeared to keep the first one company. It produced just one flower and hasn’t attempted to flower again since. 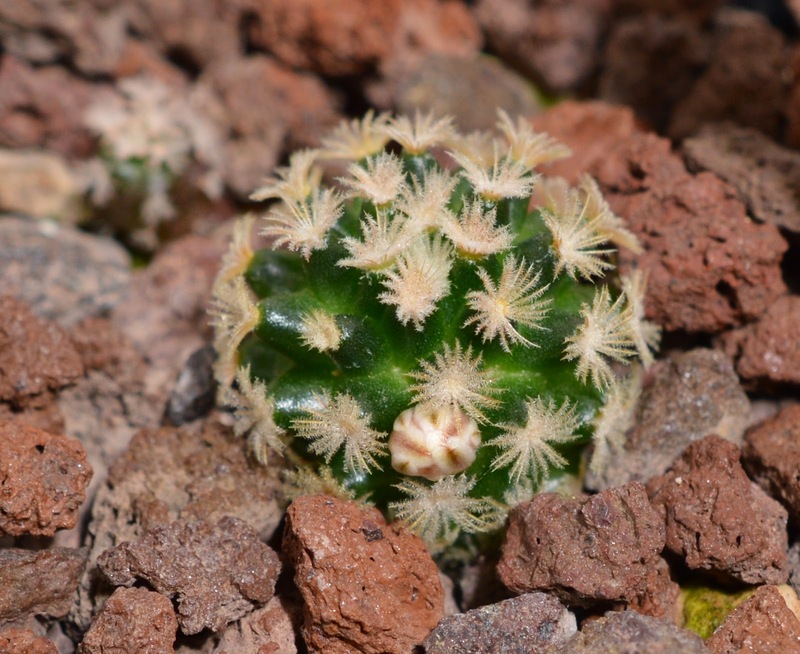 It is a relatively new discovery and according to Hunt et al (2006) it is likely just a neotenic (retaining juvenile characteristics into adulthood) form of Mammillaria lasiacantha. It certainly seems to be a neotenic form, though whether it is just a form of M. laiacantha I feel is too soon to say (at least for me). 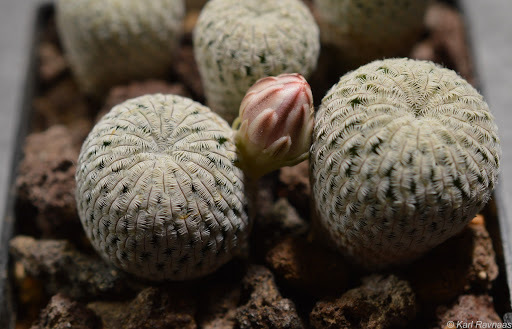 Mammillaria roemeri in bud. The plant is about 2 cm in diameter. Mammillaria roemeri with the flower wide open. It’s a very nice shade of pink with a slightly darker mid stripe. The flower is about 1,5 cm in diameter. 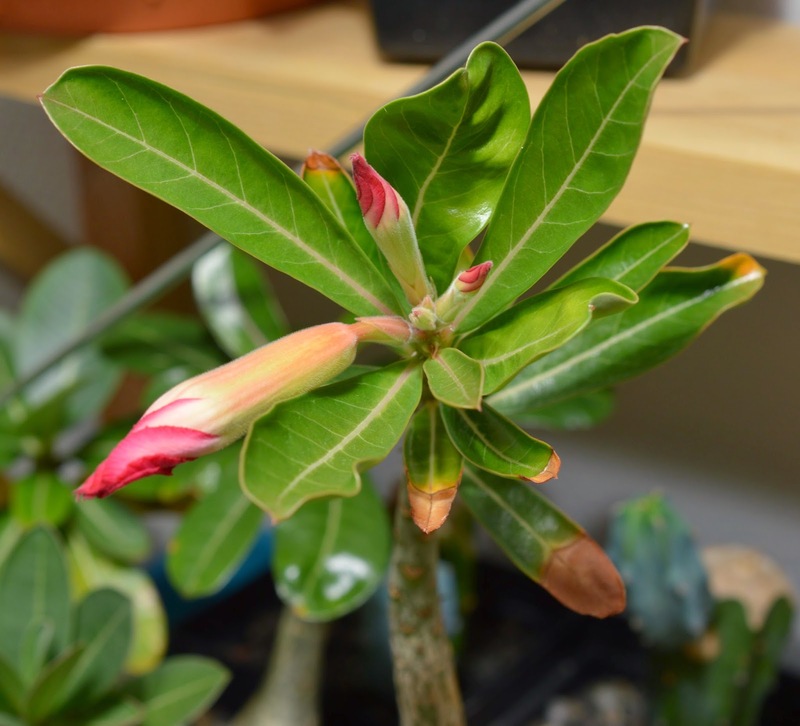 After this, Adenium multiflorum decided to go next at 12 months old. I can’t honestly say that it looks very different in appearance compared to my A. obesum or A. arabicum apart from being slightly taller and more elongated, but maybe it will in age. 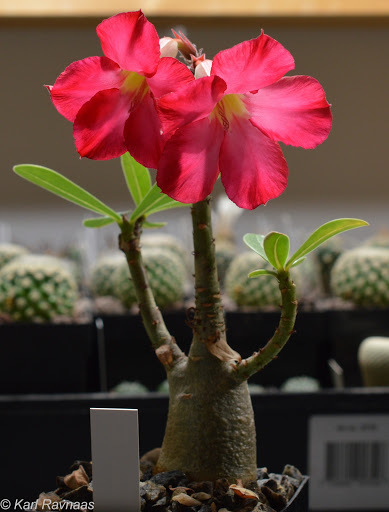 Adenium multiflorum with buds. It’s about 15 cm tall. 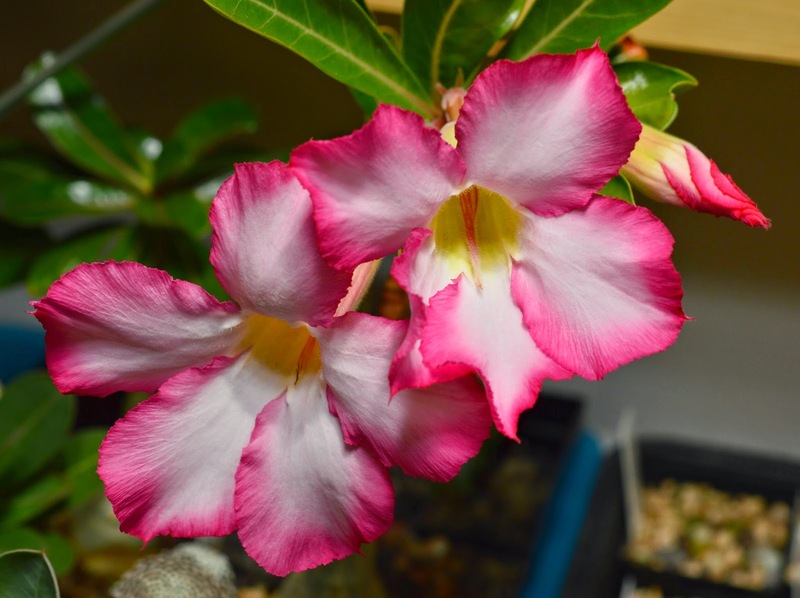 Adenium multiflorum with lovely coloured flowers. The flowers are ca. 6 cm in diameter. 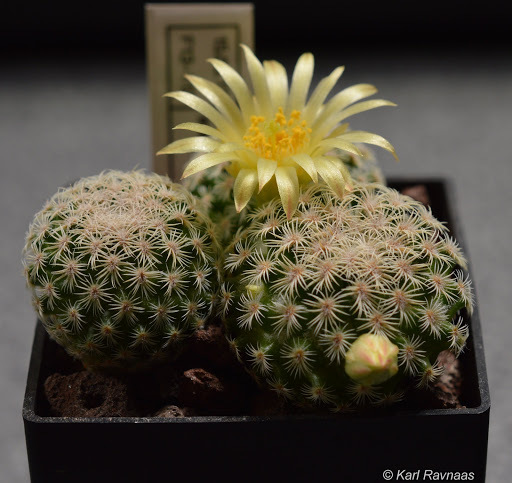 Mammillaria hernandezii was the next one out at 11 months old, and put on quite a show for about a month. About seven different plants produced flowers, though none of them produced more than one. I kept pollen in the fridge and pollinated every flower so I expect some of them will have set fruit, though it’s difficult to tell since they are cryptocarps, keeping the fruits hidden in the plant body. 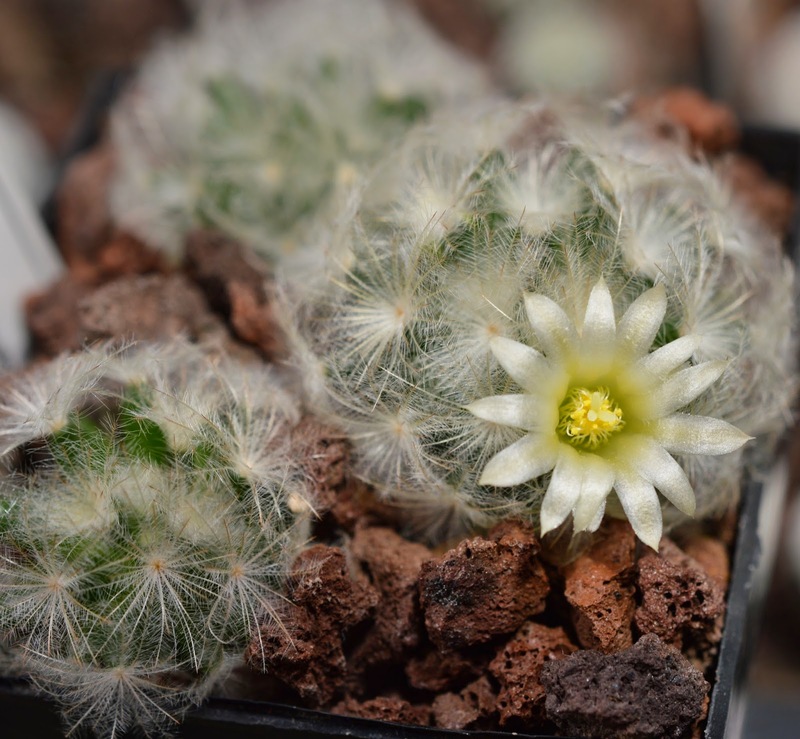 The first Mammillaria hernandezii to start flowering. As can be seen there are several plants with buds. The plants are approximately 1,5-2 cm in diameter. 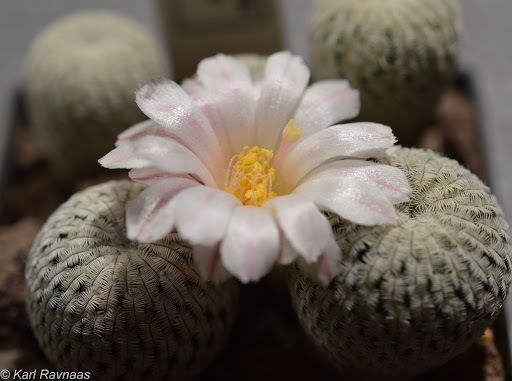 Close-up of Mammillaria hernandezii with flower. The colour is very nice and the camera doesn’t quite do it justice. The flowers are ca. 2 cm in diameter. 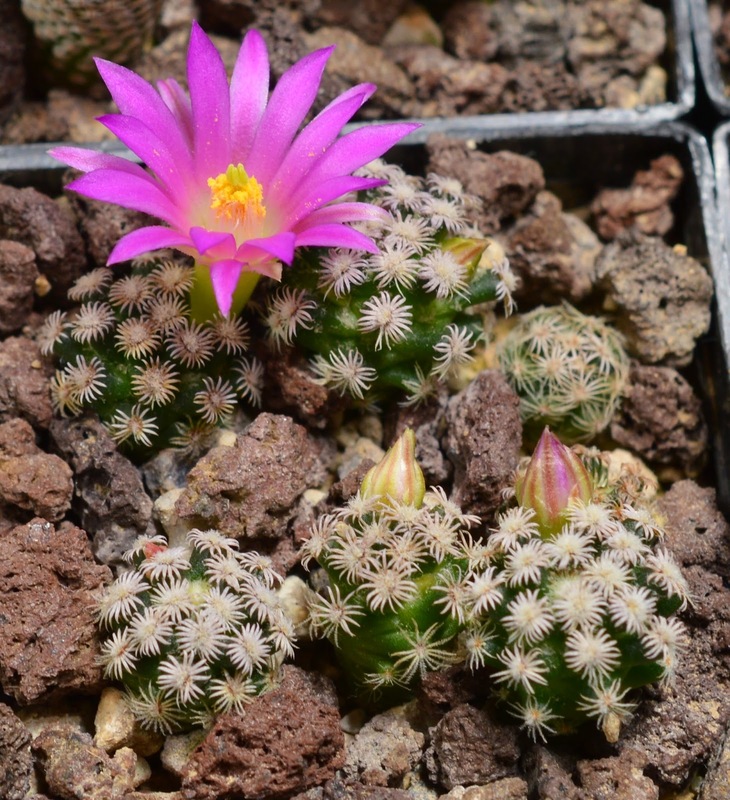 At the same time Mammillaria plumosa began flowering, also at 11 months old. It’s a very pretty plant and while the flowers aren’t as spectacular as in M. hernandezii, they are nevertheless charming. Both these species usually flower late in the year from autumn to winter, so I was pleasantly surprised not just that they flowered but that they flowered in September already. A lack of sunlight is usually the cause for their lack of willingness to flower in Northern Europe, so I take it as evidence that they’re receiving sufficient and good quality light from my artificial lighting. 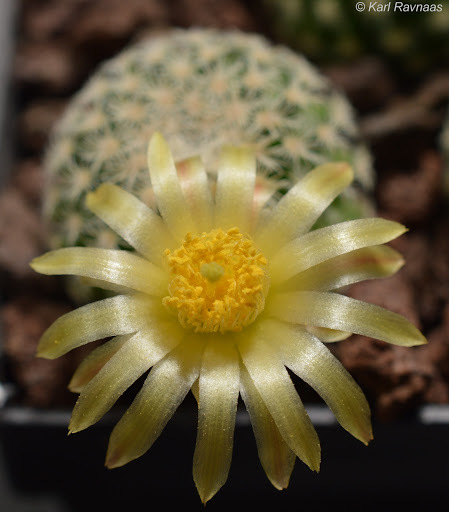 Mammillaria plumosa with a pretty little yellowish flower just starting to open. The plant is ca. 3 cm in diameter. Mammillaria plumosa with the flower wide open. The flower is ca. 1 cm i diameter. It produced two more flowers before decided that was quite enough. 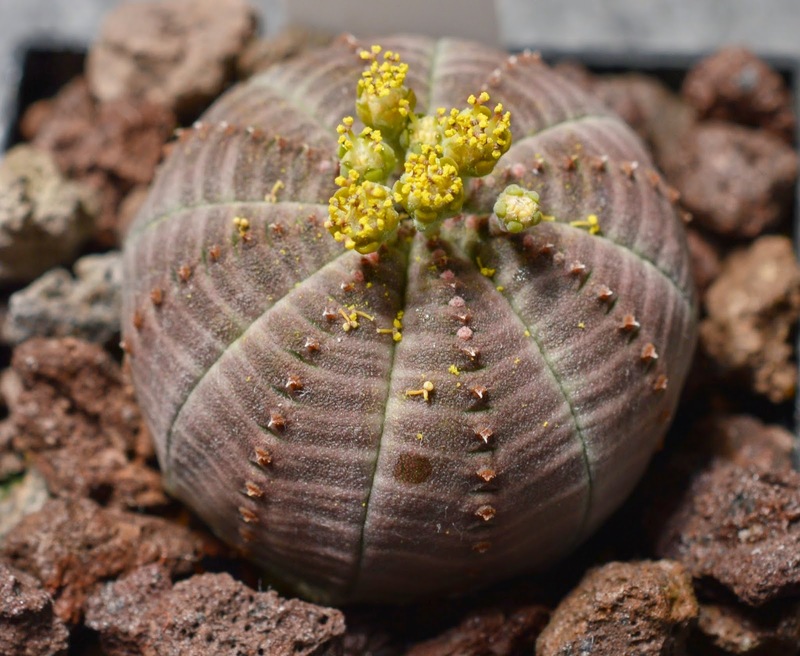 I have a grand, old and elongated lady Euphorbia obesa that has faithfully produced flowers every summer for years now but, sadly, she’s remained an old spinster. Until now that is, when a strapping young lad appeared ready to pollinate everything in sight! 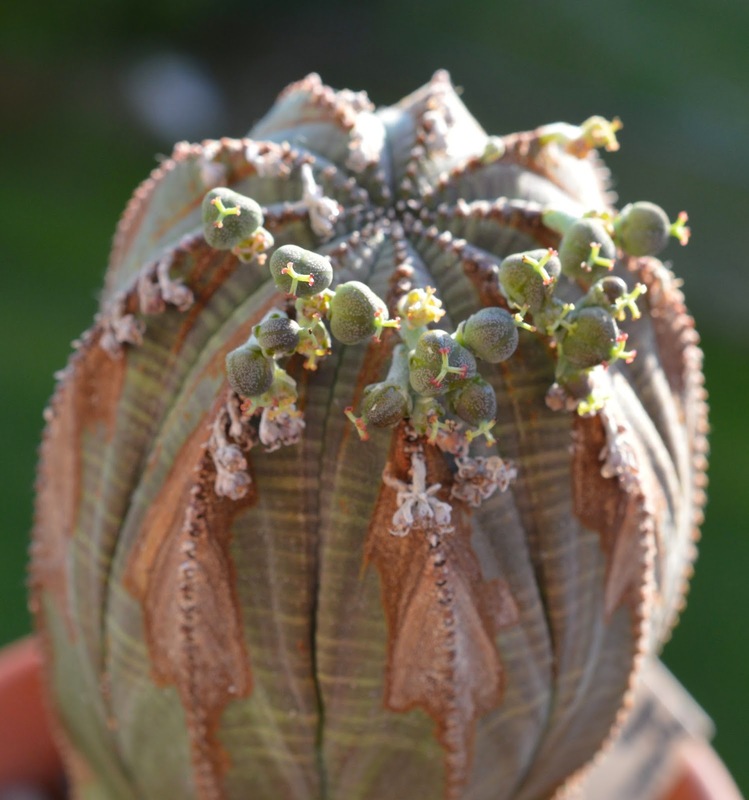 The old, yet still very fertile, Euphorbia obesa with lots of seed pods! 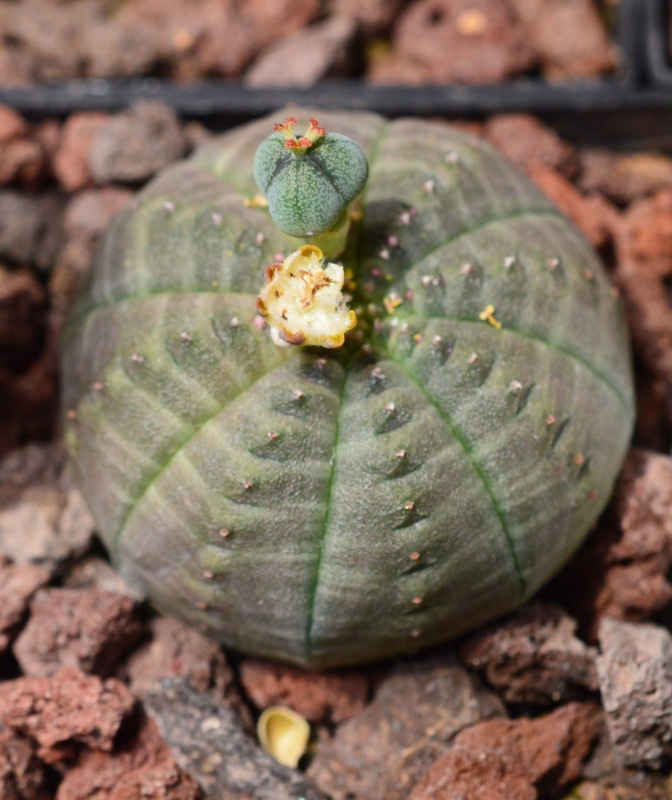 The male Euphorbia obesa at 13 months old, ready to enjoy life. This species has male and female flowers and without one of each there’ll be no little children. The plant is ca. 3,5-4 cm in diameter. Another female E. obesa, also 13 months old. This one has also been visited by the male pictured above and the fruit is just starting to develop. 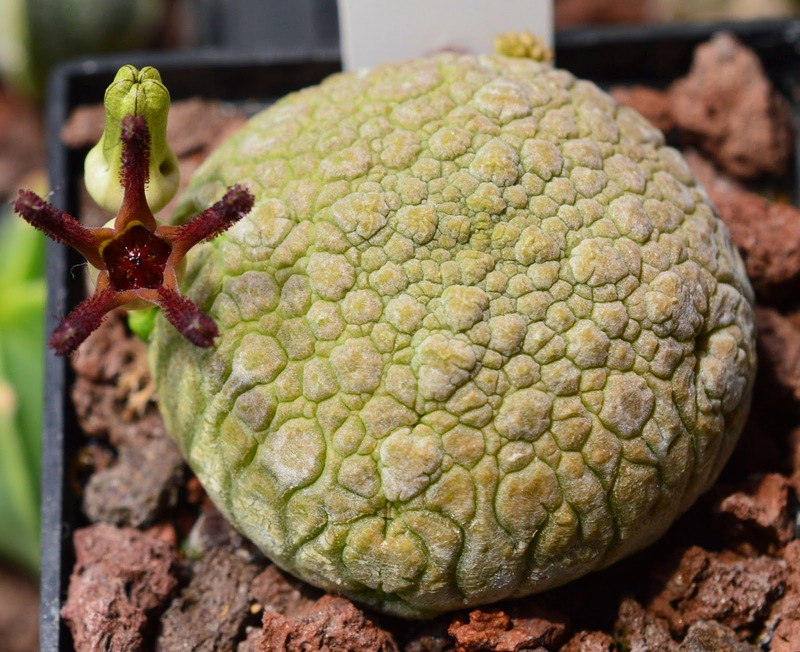 The next one to start flowering was Pseudolithos cubiformis at 14 months old. It is a lovely plant with very interesting flowers. It does look quite like a rock and I can well imagine it must be difficult to find in habitat. The flowers smell like rotting meat in order to attract flies. I had no flies on hand, and without them I believe it is quite difficult to pollinate these plants. If anyone knows a good method to pollinate them I’d love to hear it! 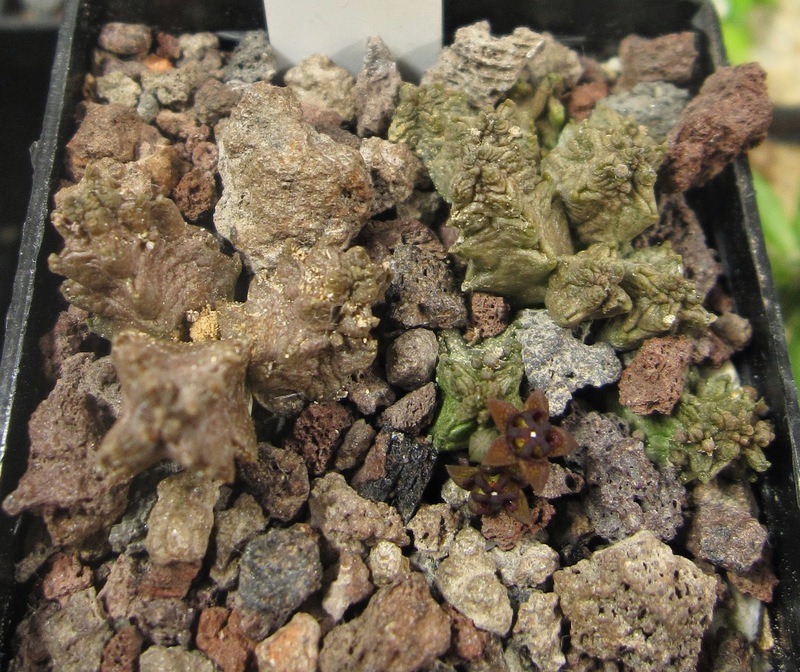 Pseudolithos cubiformis with a cluster of buds on the right. The plant is ca. 4 cm in diameter. In the lower part of the picture can be seen another cluster of buds about to develop, though they haven’t developed yet. 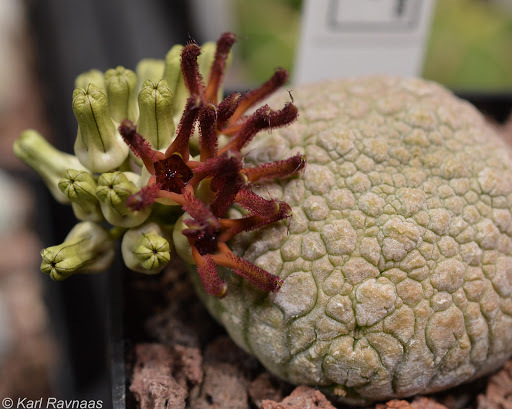 Pseudolithos cubiformis with one flower just opening and another about to open right behind. The flower is ca. 1,5 cm in diameter and smelled like rotten meat. These two flowers are the only ones that have developed from the large cluster seen in the image above. 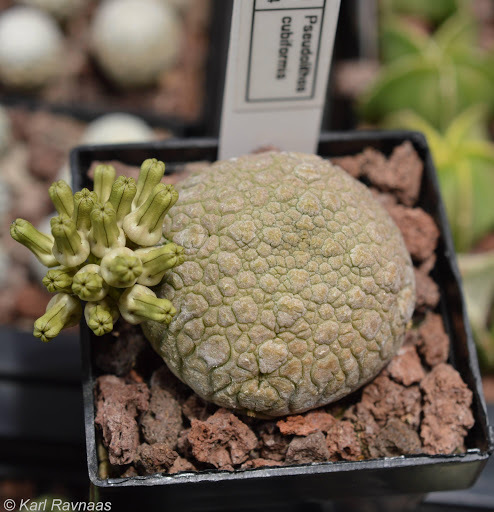 I must admit I have no experience with Pseudolithos from before, so I don’t really know what this is. 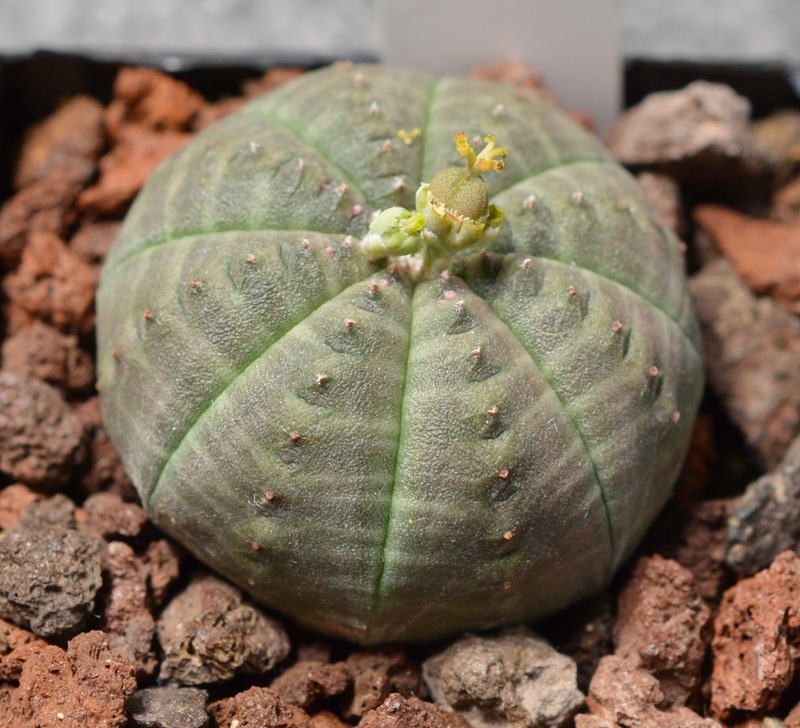 Based on this picture I assume the species produces male and female flowers like Euphorbia obesa, though I don’t really know whether these are male or female. The flowers are very small – probably no more than a couple of millimetres in diameter. I’d love to hear any tips or tricks to get these plants to set fruit. Finally, the last plant to flower so far was Rebutia narvaecensis ‘espinosae’ at 14 months old. 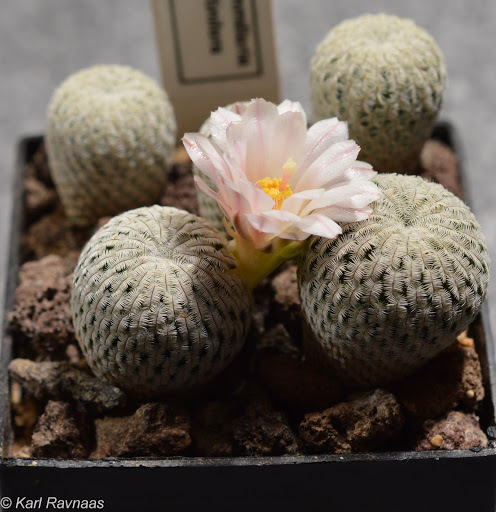 The name ‘espinosae’ was never validly published according to Pilbeam (1997), so the label should perhaps just read Rebutia narvaecensis – though according to a recent molecular phylogenetic study by Ritz et al. (2007) it should probably be called Aylostera narvaecensis instead. In any case, I’ve sown regular R. narvaecensis too, so I won’t be changing labels quite until I see whether there are some notable differences between them. Rebutia narvaecensis ‘espinosae’ with their very pretty flowers. It tentatively began with this one flower, but it seems it thought the whole thing rather enjoyable and is now setting several more buds. The same Rebutia narvaecensis ‘espinosae’ from a slightly different angle showing the flower tube and the plant more clearly. The flower is ca. 2 cm wide, while the plant is probably about 2,5 cm wide. Donati, D. & Zanovello, C. 2005. 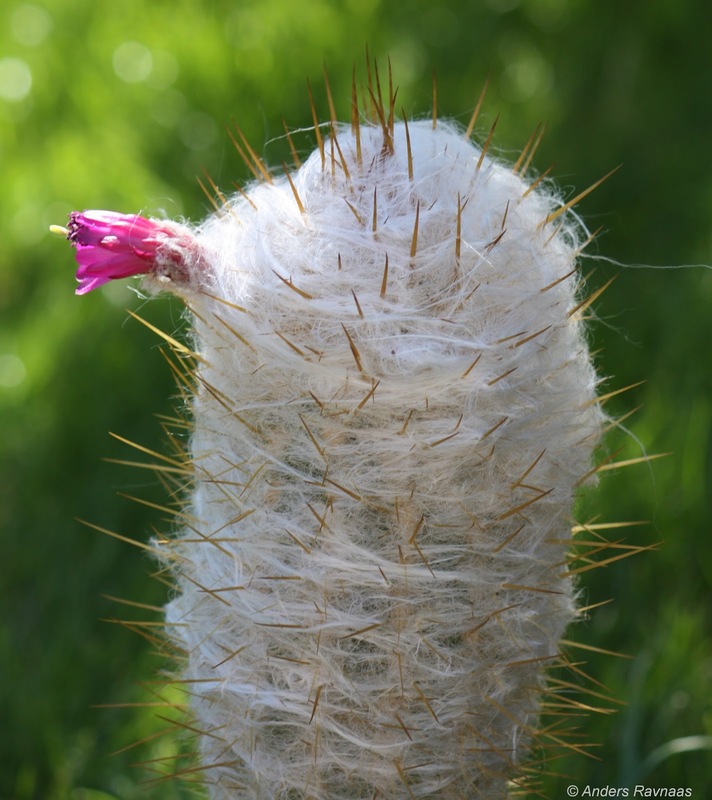 Knowing, understanding, growing Turbinicarpus – Rapicactus. Cactus Trentino Südtirol, Trento, 254 p.
Hunt, D. (ed. ), Taylor, N., Charles, G. 2006. The New Cactus Lexicon [Text]. dh books, Milborne Port, 374 p.
Pilbeam, J. 1997. Rebutia. Cirio Publishing Services Ltd., Southampton, 160 p.
Pilbeam, J. & Weightman, B. 2006. 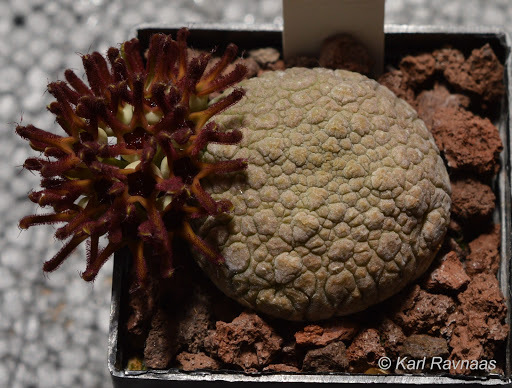 Ariocarpus et cetera. BCSS, Essex, 140 p.
Ritz, C.M., Martins, L., Mecklenburg, R., Goremykin, V., Hellwig, F.H. 2007. 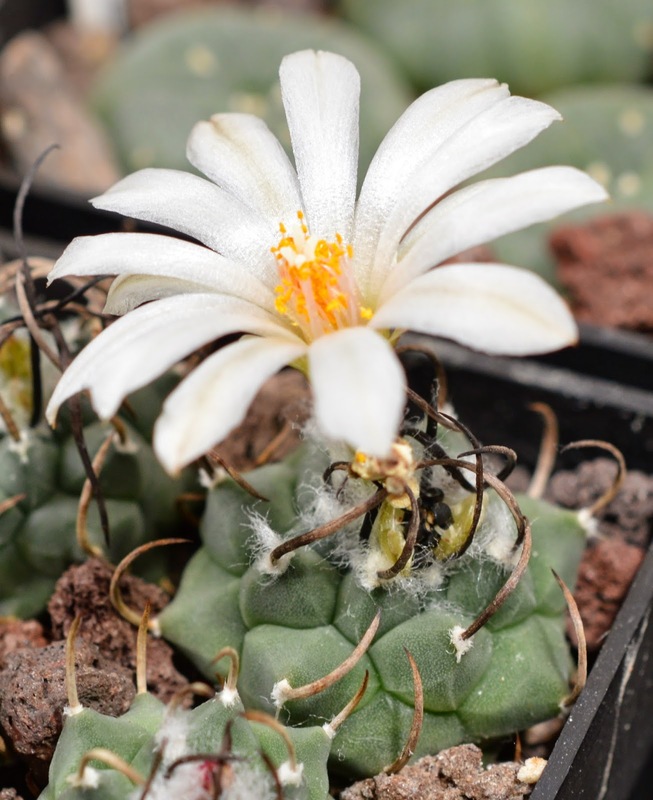 The molecular phylogeny of Rebutia (Cactaceae) and its allies demonstrates the influence of paleogeography on the evolution of South American mountain cacti. American Journal of Botany 94, 1321-1332. Zachar, M. 2004. The Genus Turbinicarpus. 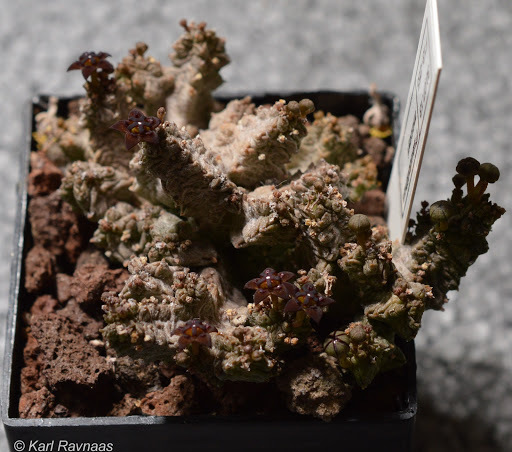 Spolocnost Cactaceae etc., Bratislava, 144 p.
As with all things related to cacti you can make it as complicated or straight forward as you like, and there is no guarantee that overly complicating things lead to better results. 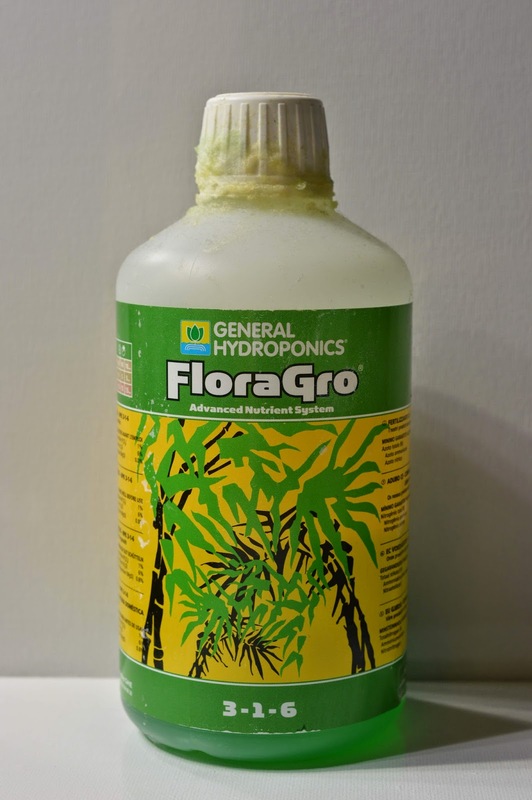 On the other had, not caring about such things as the pH-level of your water or the effects of the fertiliser you use will likely have a detrimental effect on your plants. The below paragraphs on watering is about seedlings, but the other parts of this post is just as valid for adult plants. Watering when it comes to seedlings isn’t really as complicated as it sometimes can be when they’re all grown up. As adults they may have wildly differing requirements when it comes to watering, but at this stage they all have much the same needs. 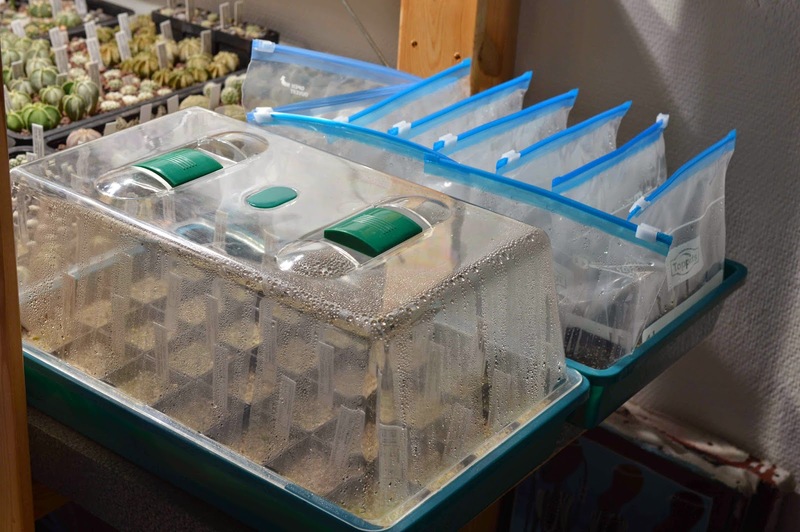 Young seedlings which have just come out of their enclosed humid atmospheres like their soil to still be constantly moist and never to dry out completely. This doesn’t mean the soil should be dripping wet other than when you water them, but rather that they grow best if there is always some moisture present in the soil. How much moisture is a matter of experience and the species in question. Most species aren’t very demanding and at least for a beginner it’s recommended to start out with some of the easier species so as not to lose heart. 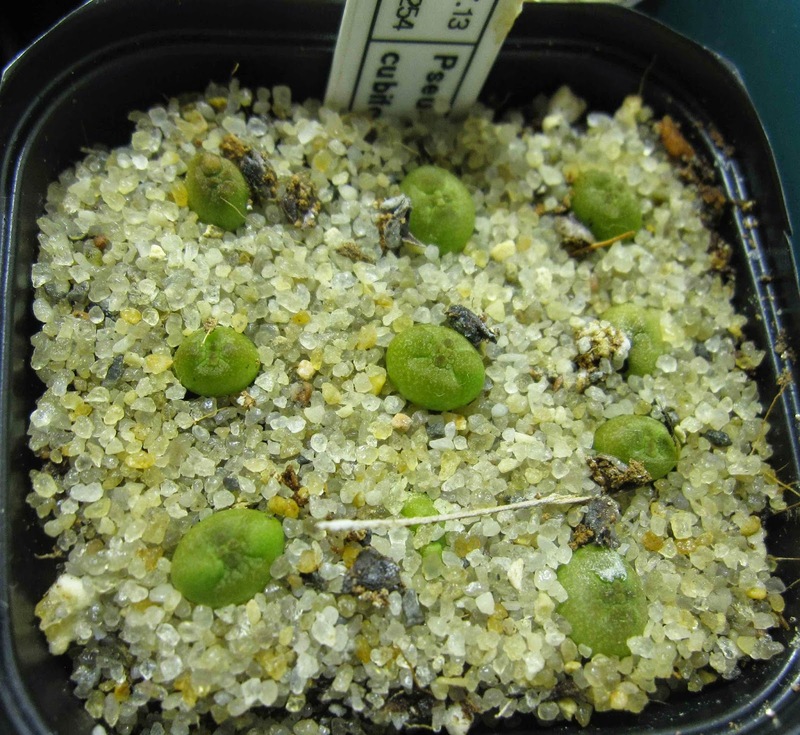 I remember sowing a tray full of Ariocarpus and Pediocactus among others when I was around 13-14 years old and after being very happy to see lots of seedlings appear, it was just as disheartening and demoralising to see them all die within a month, some from fungi, some from rot and some from drying out. to have their soil dry out between waterings at this stage. 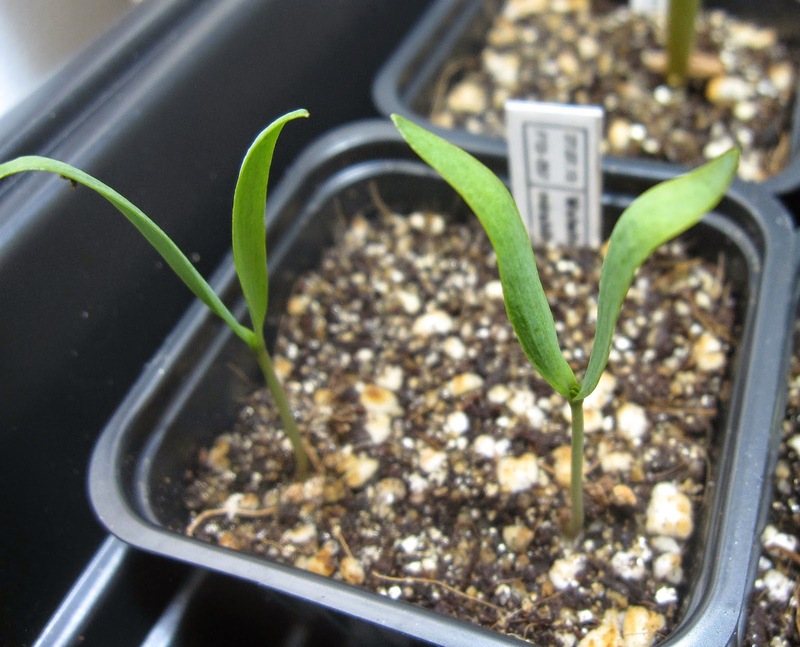 Generally speaking, the first three months of a seedling’s life are the most difficult. It’s at this stage they’re most at risk of fungal attacks and drying out. If you can keep them in an enclosed humid atmosphere for this entire time without any problems with fungi or too moist conditions, all the better. Often this isn’t possible though, and you may often have to remove your plants from humid conditions sooner rather than later. When this happens you are immediately risking the seedlings drying out, so extra care needs to be taken at this point to ensure that they don’t. 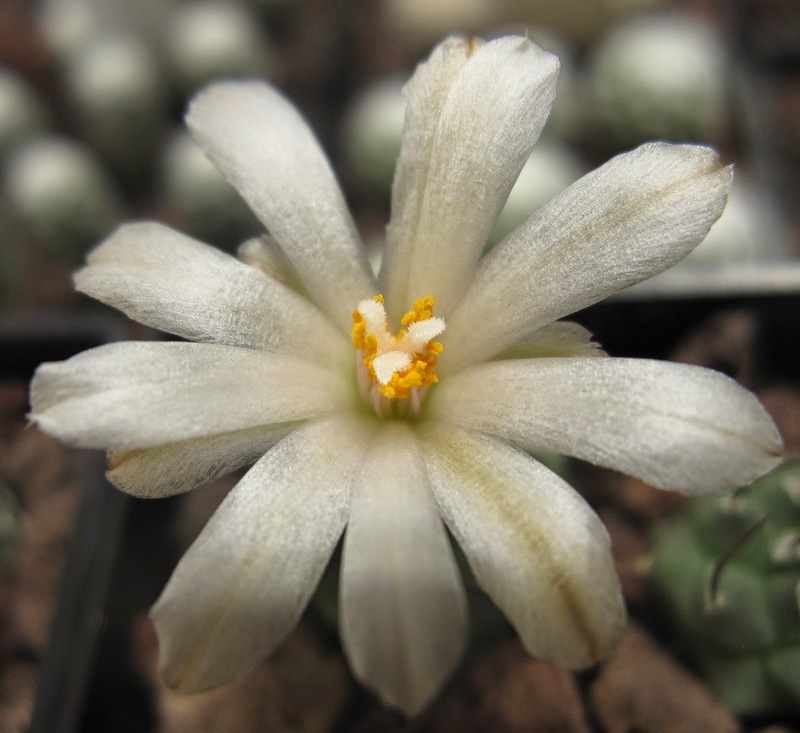 The same Astrophytum myriostigma var. nudum as in the above photo, now five months old. Once the plants are about three months old and/or show clear signs of more “adult” growth (i.e. spines, body shape, colouring) it’s usually time to allow the soil to dry out more between waterings. This will accustom the plants to slightly drier conditions and begin hardening them. Again, this is in many ways a matter of experience and takes a bit of time to get right. Depending on the species, how and where you grow them, and the level of experience you have, I’d say it’s better to err on the side of caution and water less rather than more. Even though most seedlings who may be rot prone in adulthood aren’t as rot prone yet, it’s still easy to over-water many species at this stage. myriostigma var. nudum as in the two photos above. They are now 14 months old and ready for a new repotting only six months after their previous one. If I had given them bigger pots and more breathing room in the first repotting they would all likely be larger still than they are at this point. Notice that the variety nudum refers to plants without the characteristic white flecks all Astrophytum species have to a larger or lesser degree. It is not a 100 % stable variety though, as you can see some of them with dense flocking. The other three pots in the background are filled with regular Astrophytum myriostigma and most are densely flocked, yet still a couple have almost no flocks at all. It’s a bit intuitive as well. When you see the soil clearly drying out or some seedlings beginning to shrink a bit, it’s time to water. And if you see that some seedlings are rotting and algae and mosses are growing freely it highly likely means too moist conditions. With a little bit of practice it isn’t too difficult to reach a happy balance. Most seedlings a also forgiving of mistakes. Whether you water from above or below, or only spray, is a matter of choice, though small seedlings may quickly be disturbed by overhead watering. Personally I usually only spray to add a bit of moisture if I think the pots are slightly on the dry side, yet not so dry as to need a full watering, while I only water from below when it’s time to water them properly. Any excess water in the tray should be removed within an hour or two, though it’s probably best to do it right away so as not to forget all about it. 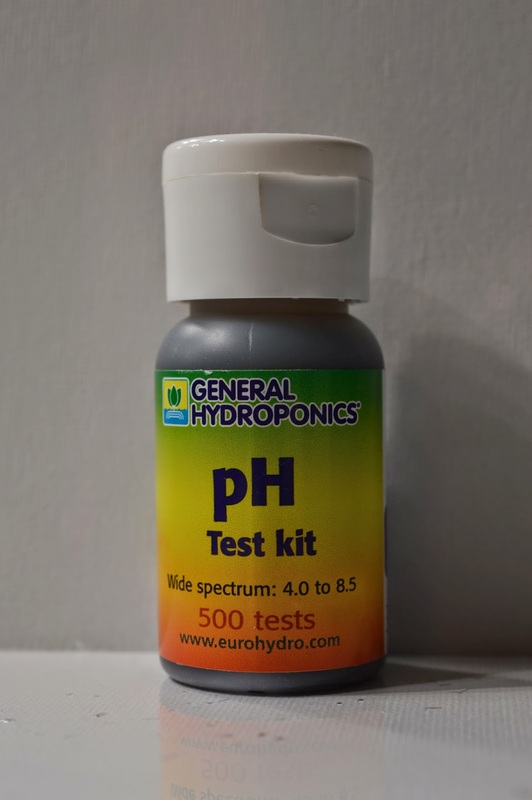 The pH of the soil is very important, and any major imbalances one way or another will likely stunt the growth of your plants or stop them growing altogether. Most cacti and succulents receive water by way of rain which is acidic. Usually rainwater has a pH of around 5 but, coupled with thunder clouds (which often happens in summer) the pH of rainwater can reach as low as 2-3. Tap water on the other hand may have a much higher pH value depending on where you live in the world. In Oslo, the water from my tap has a pH of around 8,5 and is bordering on being classified as “hard” water. What this means for the plants is that if your water is hard, it will lead to the soil eventually having a higher pH value than most cacti are happy with. Cacti (most of them, at least) seem to do best with a pH of around 5,5, which incidentally is around the level of rain water. All the growers who swear by rainwater therefore have a point. I remember the curator of the local museum where I grew up and who, together with his wife, is an avid cactus and succulent collector, only used rainwater. I didn’t quite understand why at the time, but now I do. A bottle with pH test liquid to check the pH of the water mix I use. Still, it’s not necessarily easy to only use rainwater, at least not for me living in an apartment. To make my water more acidic I therefore add a bit of vinegar now. The amount of vinegar will vary depending on the pH of your tap water and the amount of water you’ll use. For me I add about 3 ml of vinegar to approximately 10 litres of water. According to my (admittedly cheap) pH-testing kit this seems to yield a pH-value of around 5-6. I plan to test this on my larger collection in Kristiansand next year and see whether there is any noticeable effect. Many cacti, particularly in Mexico, grow in or directly on limestone which is alkaline. Some growers have therefore believed that the soils of these plants should be alkaline. However, the plants only absorb water and nutrients when it rains, and the acidic rain reacts with the limestone to release nutrients from it that the plants then absorb. Once the rain has stopped and the water drained off (which happens quickly) the plants do not interact further with the soil other than to merely use it for anchorage. 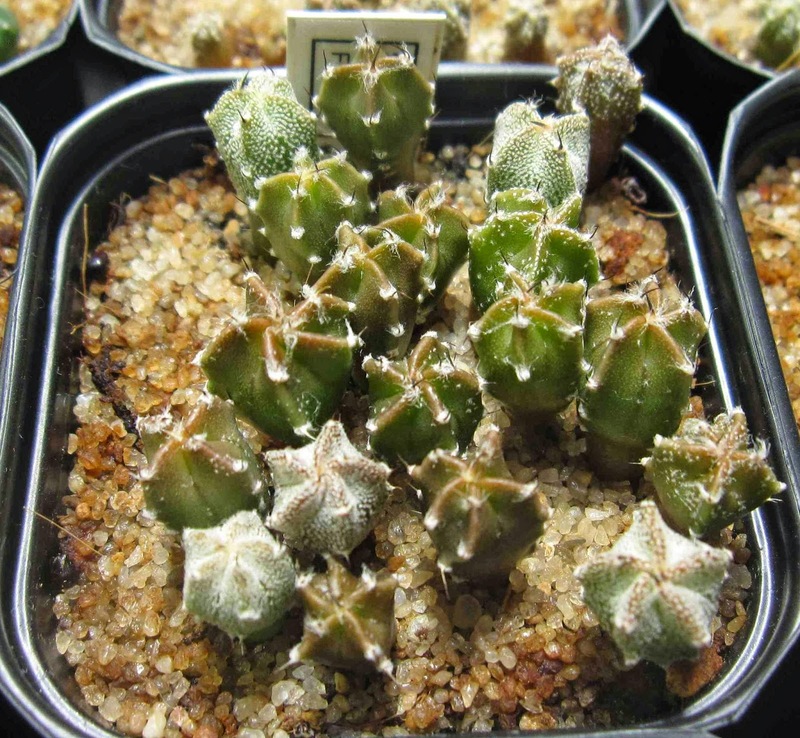 These species will therefore benefit just as greatly from slightly acidic water as other cacti and succulents growing naturally in less alkaline/more acidic soils. 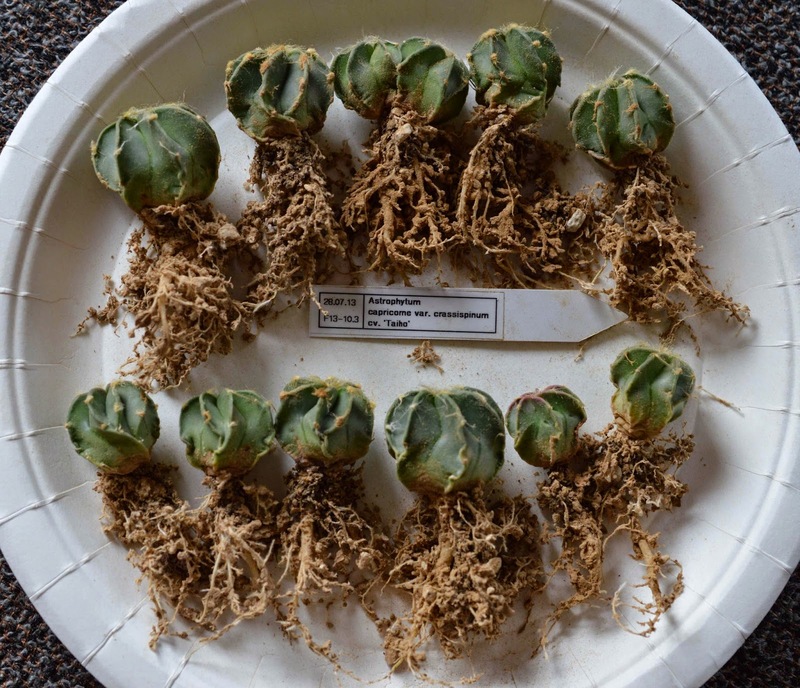 As an aside, anecdotal evidence from many growers suggest that seeds of several cactus species germinate better in slightly acidic conditions. E.g. 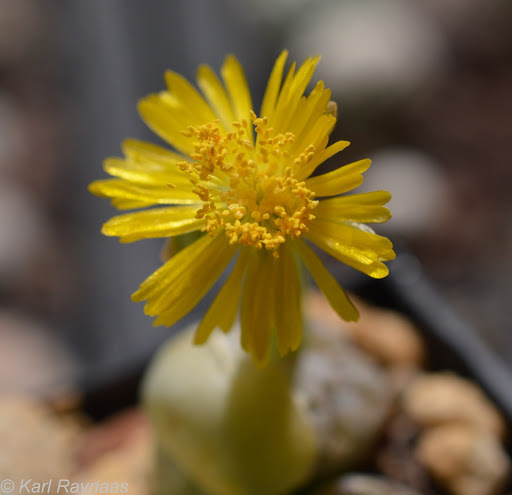 Steven Brack of Mesa Garden in New Mexico has suggested that seeds of many species sown outdoors germinate best just after thunder storms when exposed to fairly acidic rain. 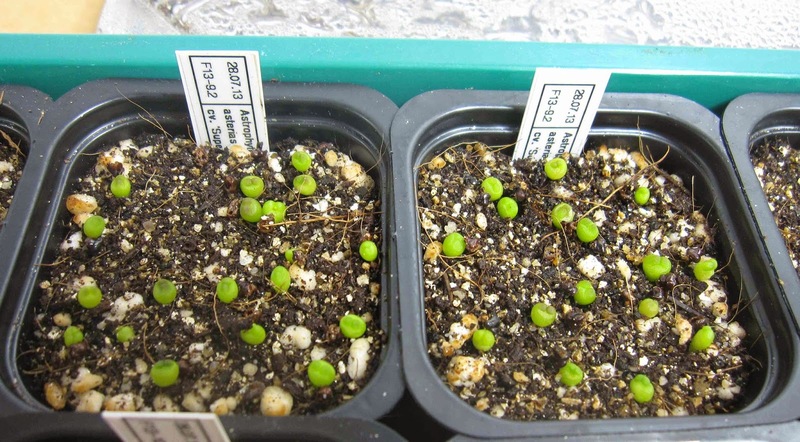 It may certainly be the case that seeds of some species have chemical inhibitors present to prevent untimely germination and are only deactivated when more acidic water is present. The topic of which kind of fertiliser to use (and, indeed, whether to fertilise at all) is apparently a much debated one. It seems every book and every article on cacti differs slightly in opinions. 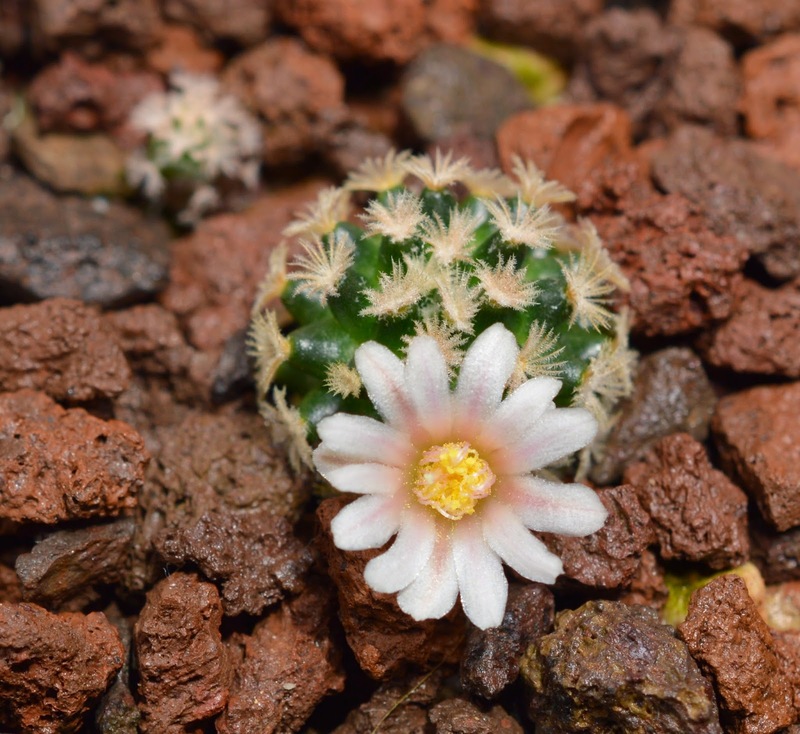 Some of it may have to do with the very different soil cacti inhabit, with some living in completely inorganic soil and others in soils consisting of mainly organic matter. Some of it may have to do with the difference in growth rates between species, where some will hardly grow at all in a year while others will race ahead. Some of it may also be down to the vary big differences in the multitude of fertiliser available on the market, and the knowledge of how they effect the plants. 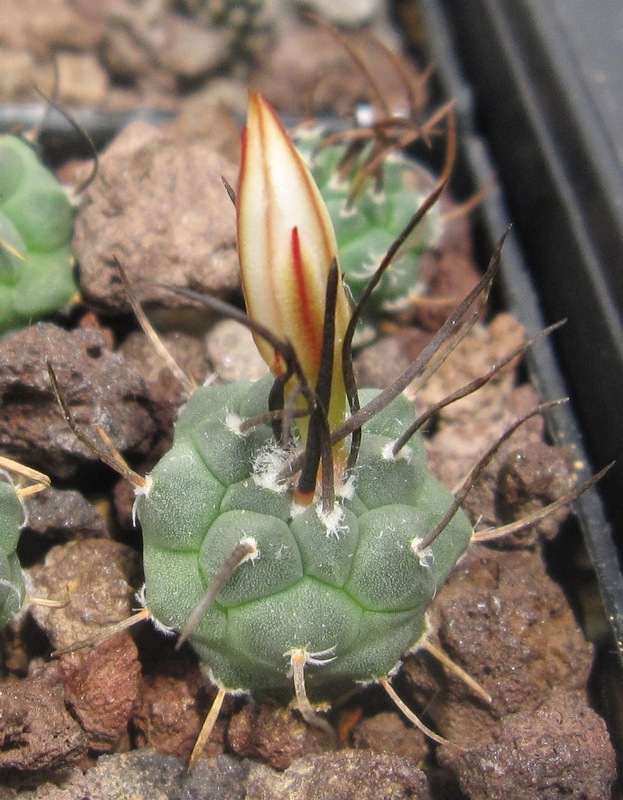 It may immediately seem counter-intuitive, but it’s perfectly possible for cacti and (I assume) almost every other plant in the world to grow in e.g. completely inorganic soil or, indeed, without any soil at all. 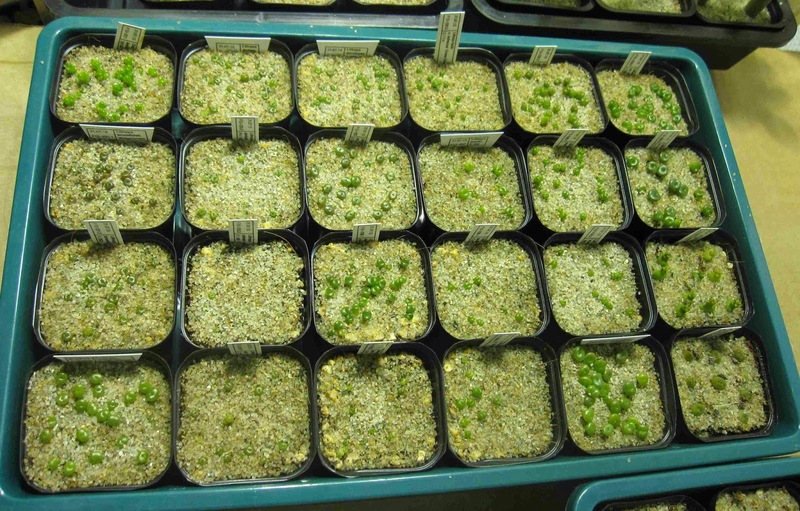 The latter method, known as hydroponic growing, can be an extremely successful way of growing plants. To grow them this way they require fertiliser to provide all the essential nutrients they need. 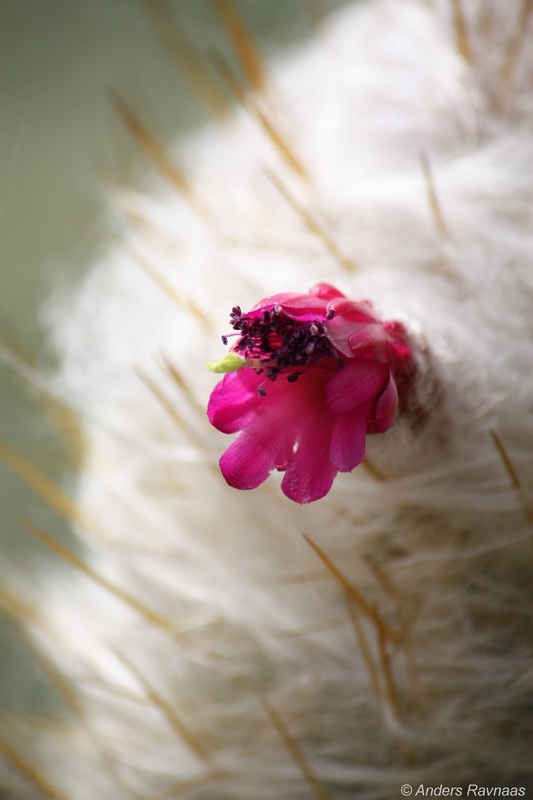 Most cacti, however, are able to grow in a completely inorganic soil without the use of fertiliser. They manage this by extracting all the nutrients they need from the soil itself. In order to achieve this the soil must be made up of components containing all the stuff they need. 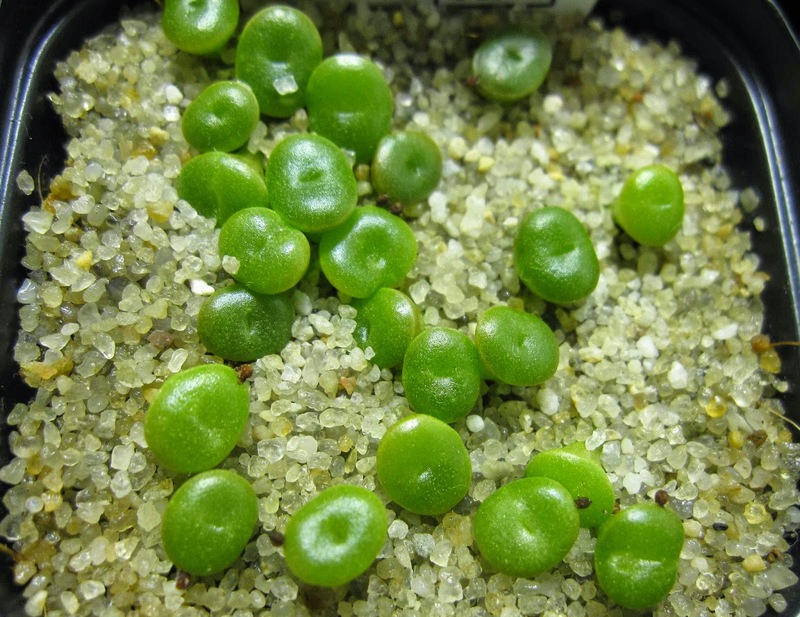 For anyone interested in trying this method out, I advise reading an excellent guide on this called “The Stone Eaters” by Dag Panco which can be downloaded free of charge from the website of the Romanian cactus and succulent journal “Xerophilia” which is a top journal in itself: www.xerophilia.ro. 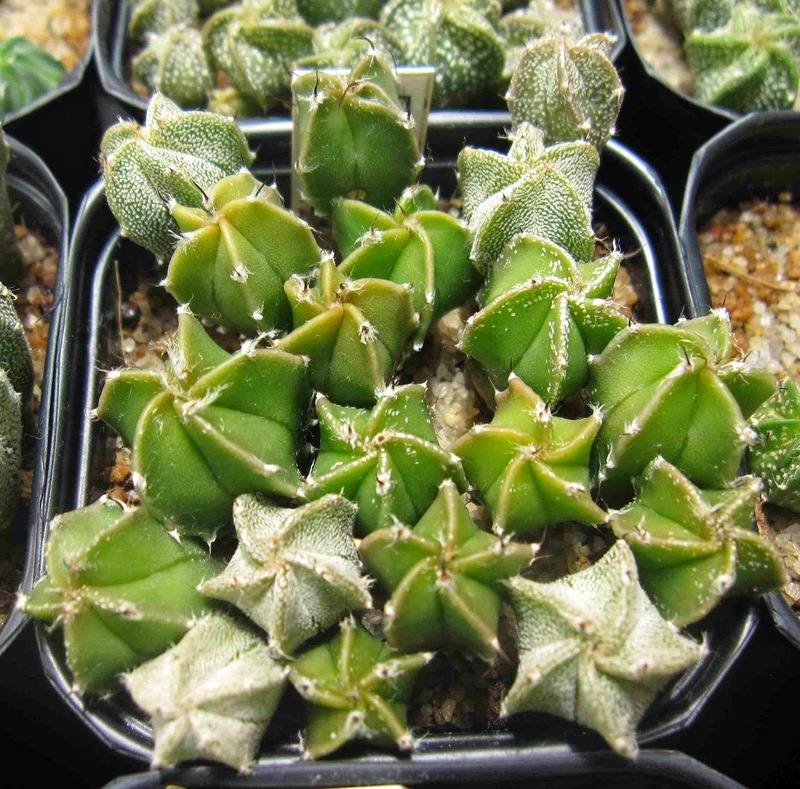 Still, most hobbyists growing cacti and succulents won’t grow their plants in inorganic soils in which the plants must work hard on their own to get food. Many hobbyists will grow their plants in nutrient-rich composts and require less fertiliser, but even so most of us will fertilise their plants whether grown in organic based or inorganic soils. Some prefer to fertilise once in the spring and maybe once in summer, some prefer slow-release granules that will release nutrients slowly over a whole year, and other prefer to fertilise regularly throughout the growing season. One of the three fertilisers I use (they belong to the same series). This one is without nitrogen, but high in phosphorous and potassium. One might think that it sounds best to just give them a lot of fertiliser and have them grow faster, but it doesn’t necessarily work that way. First of all, too much fertiliser will lead to a fairly rapid build-up of salts in the soil which, in addition to being damaging to the roots of the plant, also leads to pH-imbalances in the soil – in fact this is one of the main reasons why one should repot from time to time even if it seems like the plant doesn’t need a bigger pot. Secondly, too much fertiliser can lead to an imbalance in the level and amount of nutrients available to the plant, most common of which is too high levels of nitrogen. Phosphorus is the second letter in the N-P-K symbol, and is perhaps most important in regulating flowering. 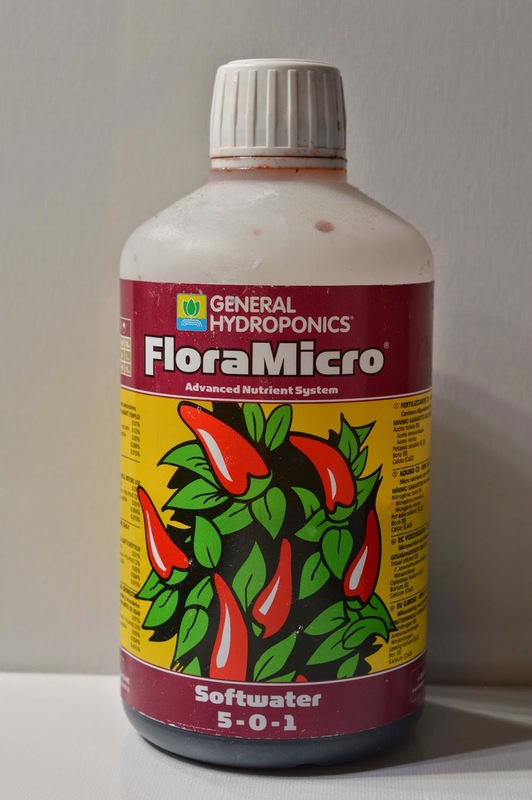 Fertilisers with relatively more of this element are usually employed when growers wish to increase the flower yield on their plants, though I don’t know of any research on how this affects cacti specifically. Potassium is the third letter in the N-P-K symbol and in cacti, at least, is very important for the development of spines and for strengthening the epidermis (the outer cell layer of the plant skin) which helps the plant against disease and pests. Fertilisers marketed at cacti are usually enriched in this element. for the plants if not repotted. Apart from these, there are many other elements cacti (and most other plants) need in various quantities such as calcium, molybdenum, manganese, zinc and iron. 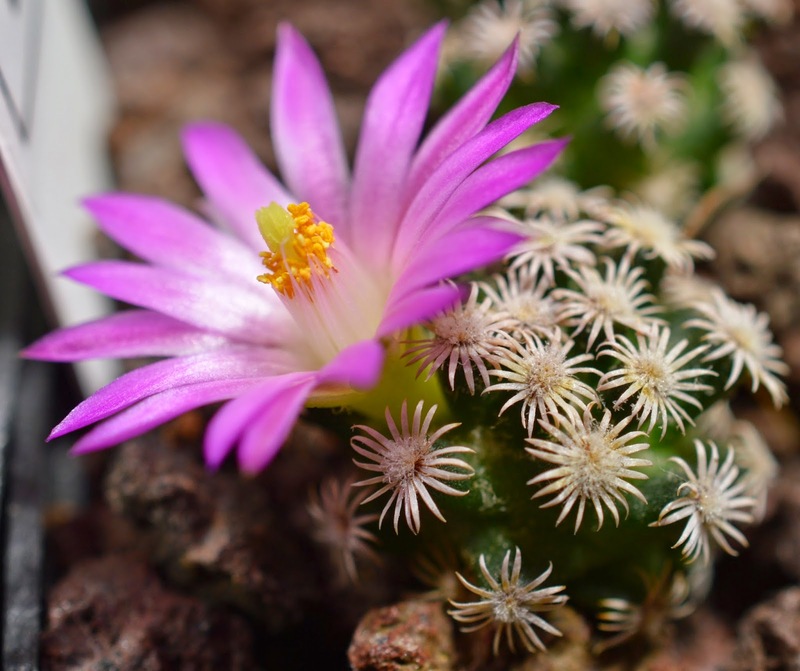 Fertilisers containing all essential elements will usually cover the needs of cacti, although it is advisable to find a fertiliser with relatively more calcium as this is a more important element for cacti than most plants. Like potassium it helps in developing spines and strengthening the epidermis. It is also advisable to find a fertiliser containing not just all essential elements, but also all beneficial elements as classified by Arnon & Stout in 1939. Personally I use three different liquid fertilisers at the moment. One is enriched in potassium, one in phosphorous and potassium, and one in nitrogen. The one enriched in nitrogen also contains all essential and many beneficial elements, as well as having a fairly high amount of calcium. I use all three fertilisers with almost every watering at probably a quarter of the recommended strength. I try to mix them evenly, though without knowing the exact amounts of the various elements by percentage it is difficult to say what the exact amount of nitrogen, phosphorous and potassium are in relation to each other in the final water mix. Fertilisers always give the N-P-K amount in numbers (e.g. 20-8-12) which is a measure of the amount of the different elements in the fertiliser in relation to each other. I believe my final mixture is something like 10-8-15 which I’m quite happy with, though there might ideally have been slightly more phosphorous and potassium. also contains all essential as well as some beneficial elements. The reason I only add fertiliser to about a quarter of the recommended amount is because most cacti and succulents are slow-growing and if fed too much will quickly grow abnormally. I have not really experimented with adding or reducing the amount of fertiliser in the mix, but it seems to work fine for me so far. Once in a while I water without any fertiliser, and then usually from above. I believe it’s a good idea to vary between watering from below and above, and watering from above once in a while also helps wash away some of the built-up salts. Finally, with regards to fertiliser, it is important to remember that fertilising the plants can be compared to feeding in humans. A varied diet containing all the essential nutrients humans need is essential for good health, and it’s the same in plants. It need not be tremendously complicated, but one should keep in mind that plants – just as humans – can react both positively and negatively to their diet. In addition to all the elements a plant needs, it is also possible to add e.g. enzymes, hormones, bacteria, fungi and more to regulate the plant’s metabolic system or life cycle, or the soil environment. This is a bit more complicated than fertilisers and I will readily admit that I’m certainly no expert. 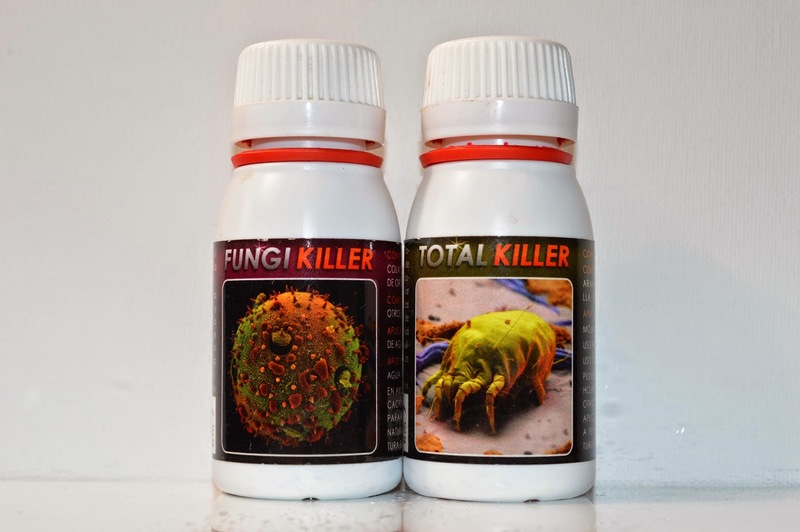 Together with the fertiliser I add a small amount of additives in liquid form containing enzymes, vitamins, humic acids, amino acids and essential oils that are supposed to stimulate root and plant growth, flowering and the plant’s natural defences. I don’t know their efficacy, though it seems to me there is a noticeable effect. Particularly the root stimulants I believe have led to a dramatically increased growth rate in most of my plants. I also believe the flowering stimulants have led to much earlier flowering in some species than would otherwise be normal. I have had very little trouble with disease and pests so it may be that the stimulant I add to increase the plant’s natural defences is working, though I am less certain of the efficacy of this particular stimulant. above. It also contains humic acids. 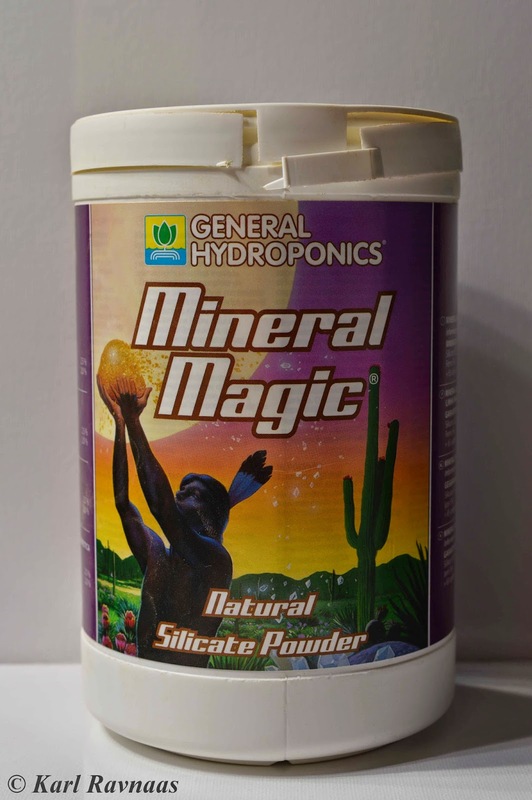 I had never used any such additives before, but after realising how widely many of these substances are used in other parts of the horticultural industry I thought they may well be very beneficial for cacti too. Though I haven’t run any scientific tests trying to make out the respective effects of the various additives, it definitely seems as if they are helping stimulate growth. Regular watering, high temperatures and long days are all very conducive to healthy and strong growth, but it seems to me that many of the plants are growing almost too well for these additives not to have a very real effect. 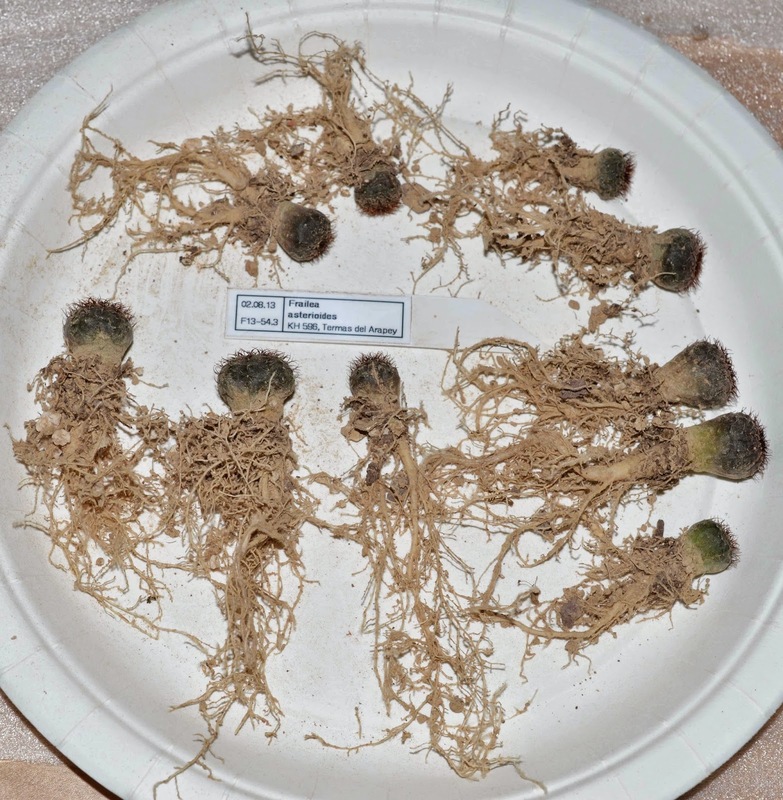 The images below show examples of the very well developed root systems of the seedlings. so they are probably not as big as they could have been if grown in an organic-based soil. The root systems are very well developed, though. The label is 8 cm long from tip to tip for scale. Astrophytum capricorne var. crassispinoides cv. ‘Taiho’ at 14 months old. in an inorganic soil. The label is 8 cm long from tip to tip for scale. does not contain hallucinogens. The tap roots are very large and very well developed. 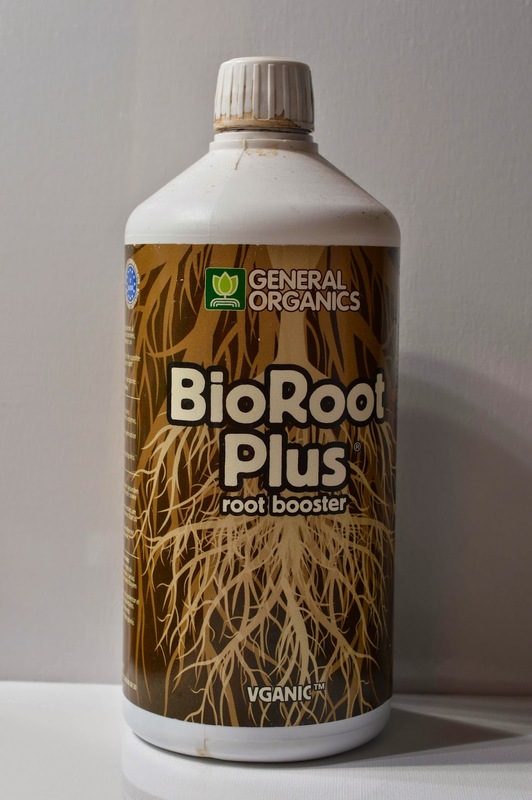 the tap root to grow larger and longer. The label is 8 cm long from tip to tip for scale.